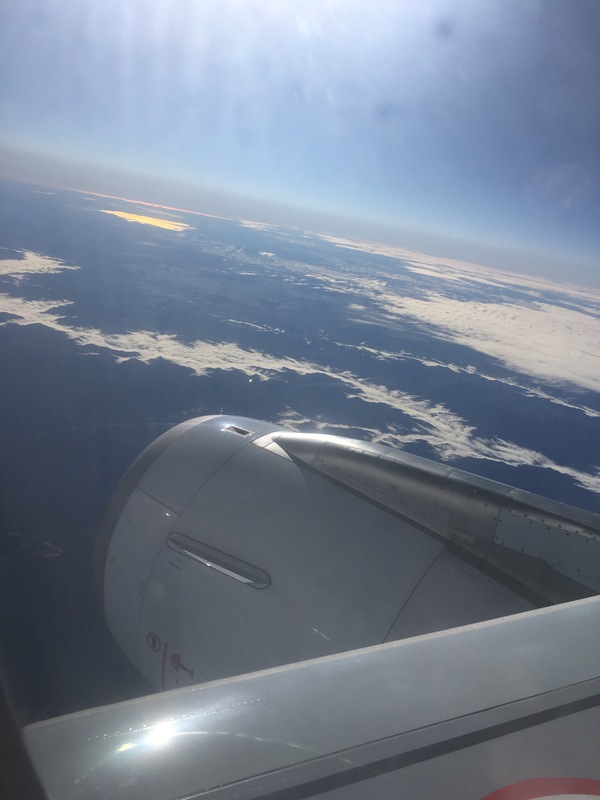 Our recent trip to Ne Zealand, was booked through Air New Zealand. This is an airline we have never had any issues with. And this trip, was no exception. Brisbane ito Auckland leg was uneventful, with the two of us the only passengers flying Works Deluxe. Seated directly behind Business Class, we were comfortable, with the guaranteed empty seat between us. Plenty of elbow room for all. Behind us were empty rows, with a handful of works passengers seated near the back of our section on the plane. We certainly felt Works Deluxe was worthwhile, meals drinks, movies, everything included. Air NZ flight attendants, treated us to business class glasses for our drinks as they felt for us being the only Works Deluxe travellers, plus a row with screens that didn’t work. We were offered alternative seats but being an evening flight, we weren’t particularly concerned. Arriving in Auckland around midnight, we headed across the tarmac to The Novotel, for a brief stopover until our morning flight to Blenheim. 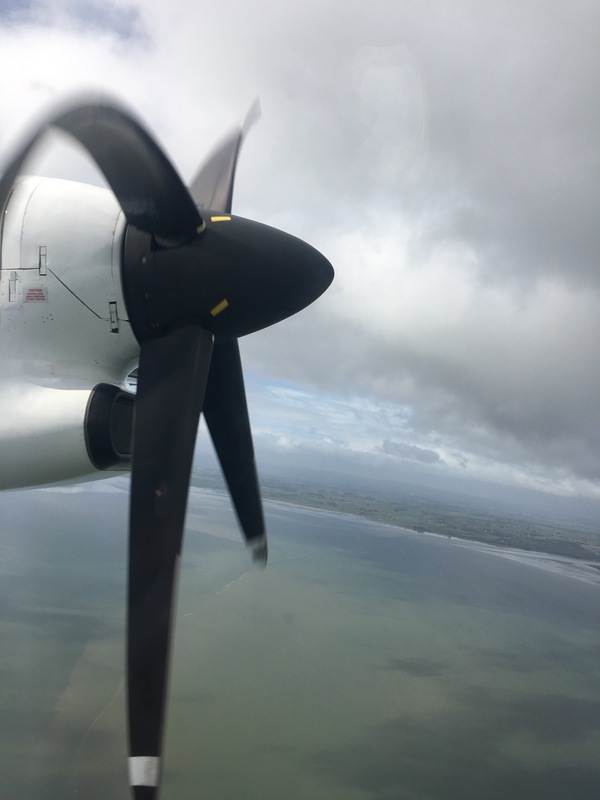 Domestic flights with NZ are different to the International. Here you are offered water, tea coffee and given a biscuit package. Now me personally, I’m not that fussed on the prop planes, so it was lucky that whilst snapping photos, I didn’t check them until we landed. The light retractions on this one were unbelievable, giving the illusion of the propeller bending. Surprisingly, given the photo above, this flight was relatively smooth, with a bumpy descent into Blenheim the worst part. 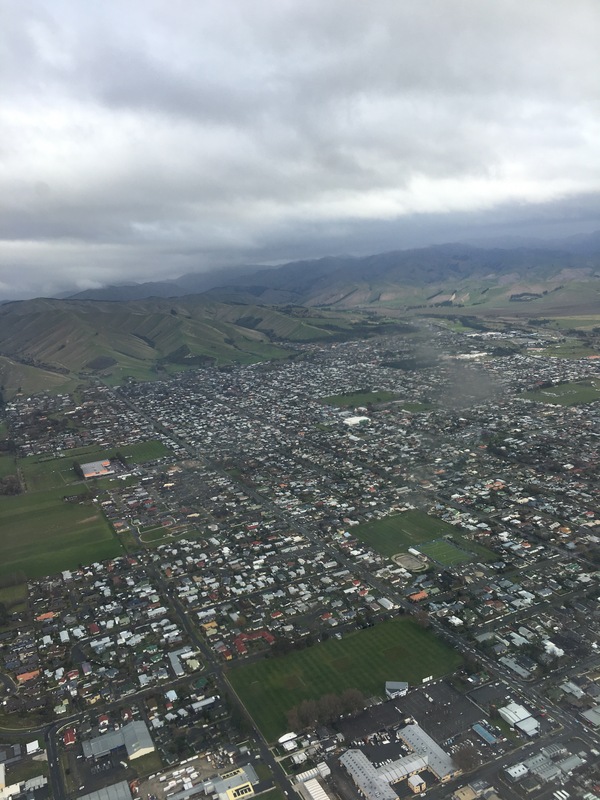 From the air, you can see the majority of Blenheim. 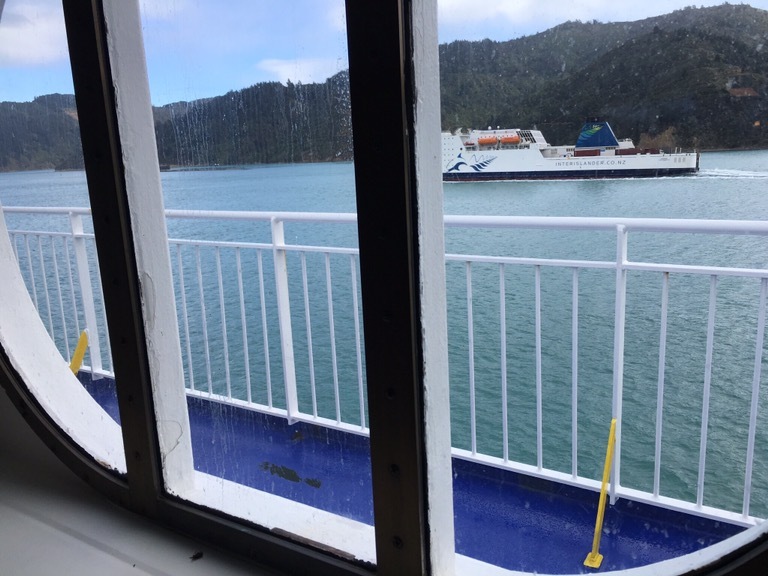 After a week of wine tasting, touring and visiting, we were off to Wellington on the Interisland Ferry. More reviews are on this blog to keep you updated on the details of the places we visited. 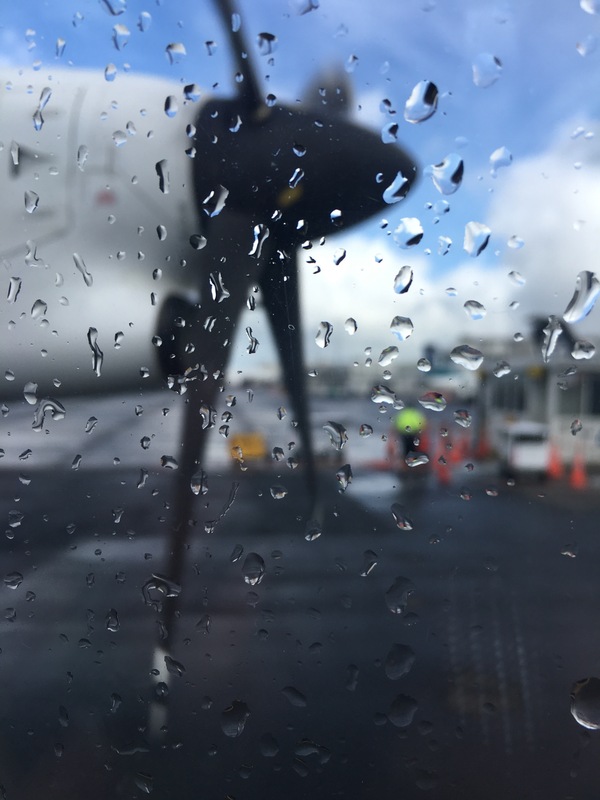 Wellington turned on its best windy, wet weather for our flight to Auckland. Very quickly though we ascended into what was a beautiful day. It appeared the dark clouds were low and thin. Some fabulous views were to be enjoyed as we quickly flew up the North Island. 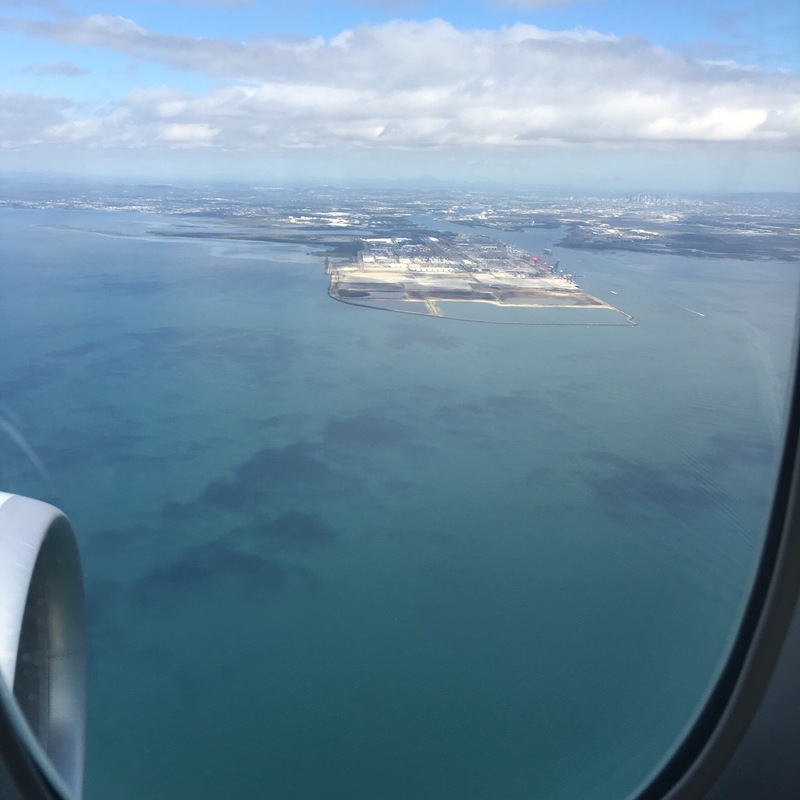 Again we enjoyed a smooth flight, descending into Auckland in what seemed like no time at all. 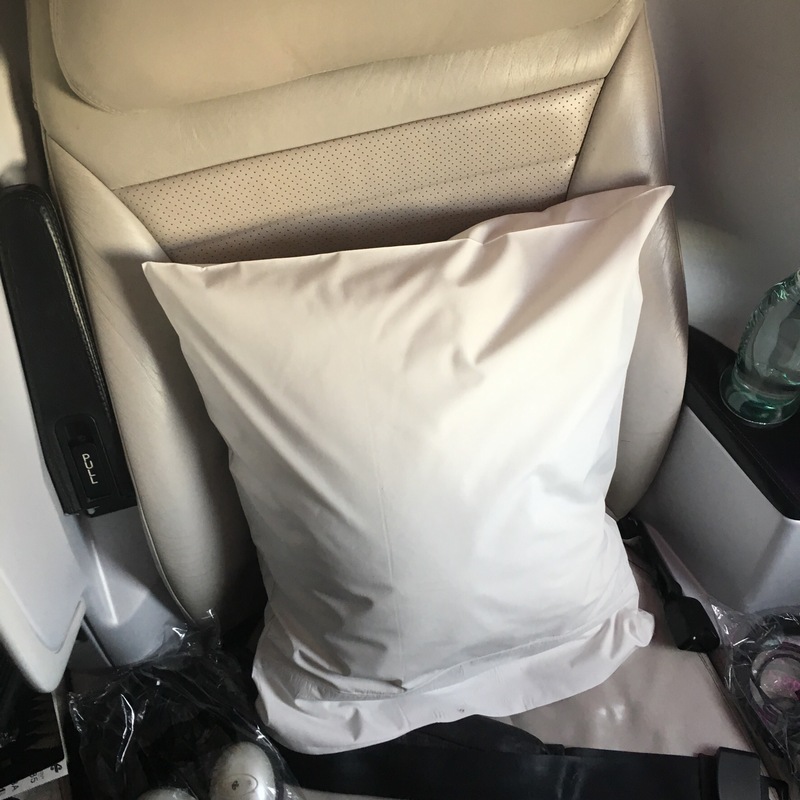 To finish our holiday, we had managed to procure Premium Economy for the flight to Brisbane, have to love Air New Zealand’s sales! A whole new world here, with big comfortable space seats. Each seat had a pillow, headphones and bottle of water waiting. Again all meals, drinks, and movies were included. Service was to Air NZ’s typical high level, certainly there could be no complaints with friendly, professional flight attendants doing everything they could to make our flight comfortable. Food quality wasn’t too bad for airline food. 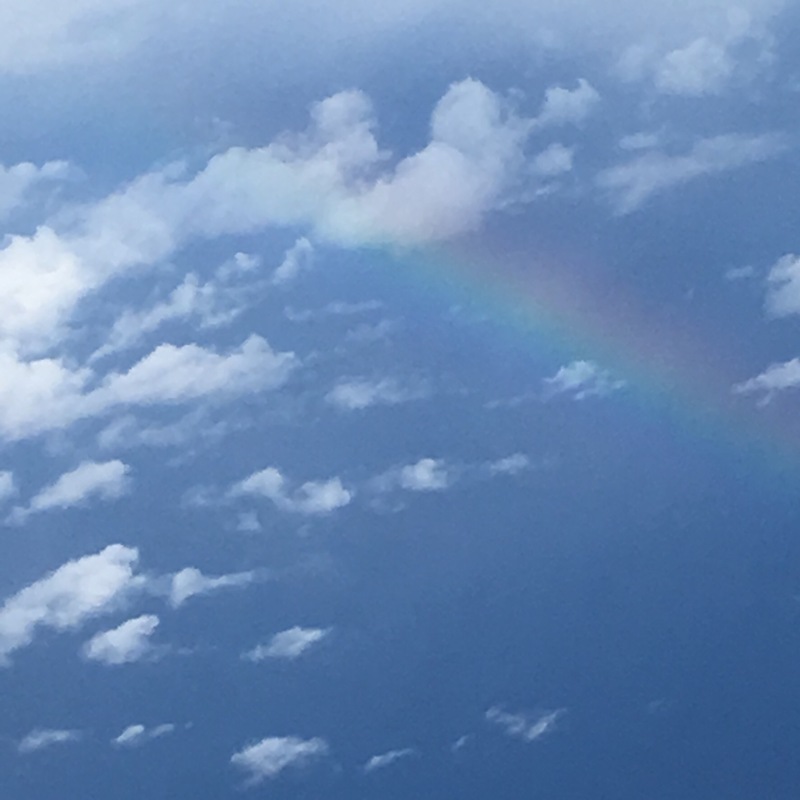 Perhaps they even organised this lovely little rainbow for our flight! 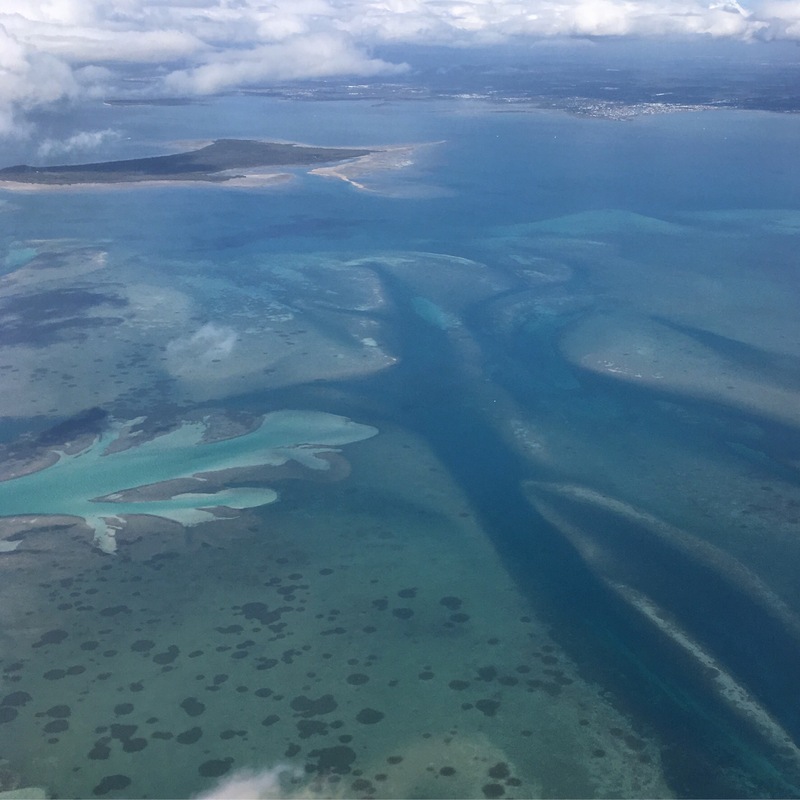 Moreton Bay looked stunning as we headed into Brisbane. Thank you Air New Sealand for contributing to making our trip comfortable and enjoyable. 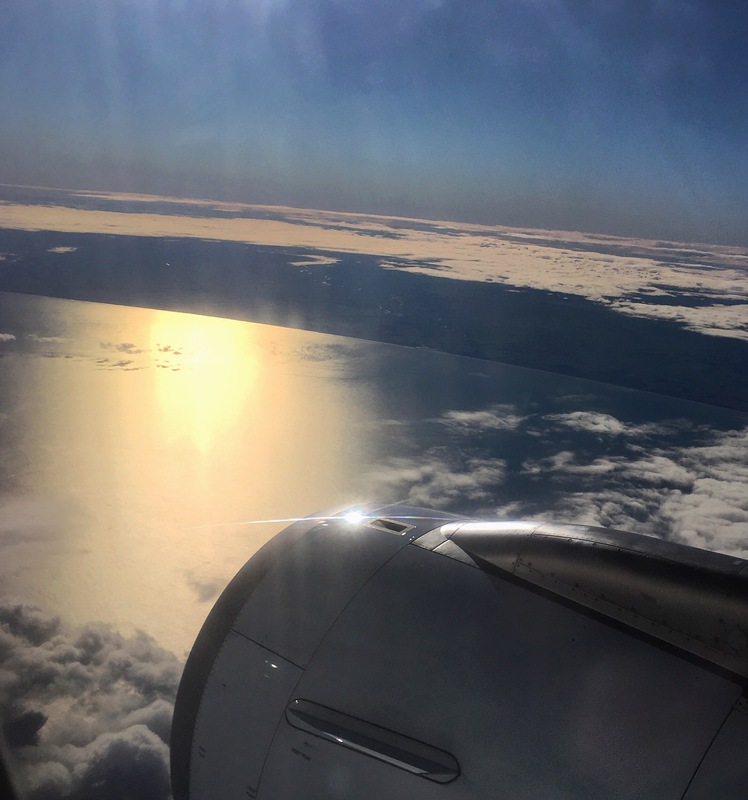 If you haven’t travelled Air NZ, give them a try, and, if you want to try those upgrades, keep an eye out for the specials! 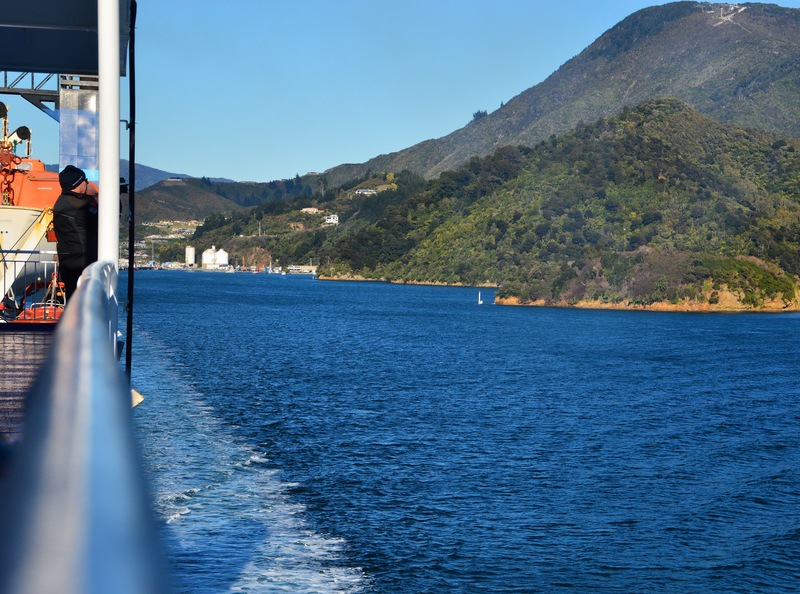 Stepping off the Interislander, we had now arrived in the North Island of New Zealand. Welcome to Wellington, Capital of New Zealand. 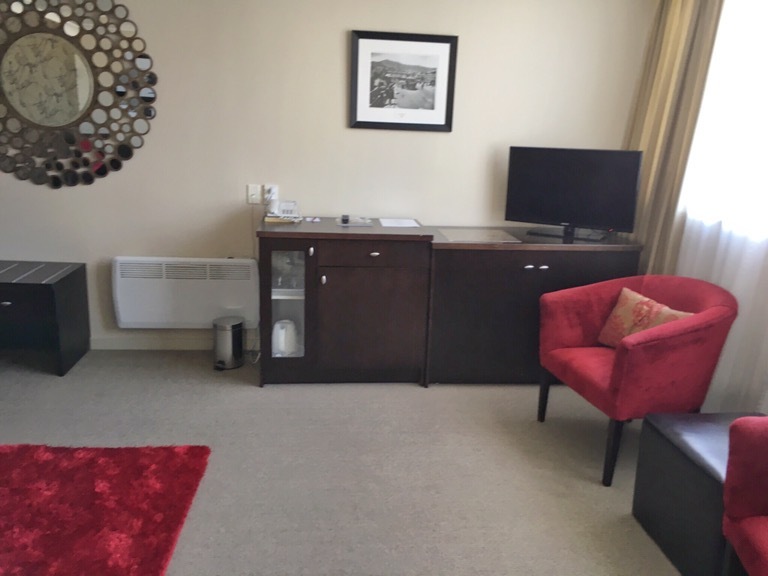 With the temperature dropping as rain clouds gathered, we had a quick drive through the city to the Le Accor hotel, Mecure Wellington Abel Tasman. 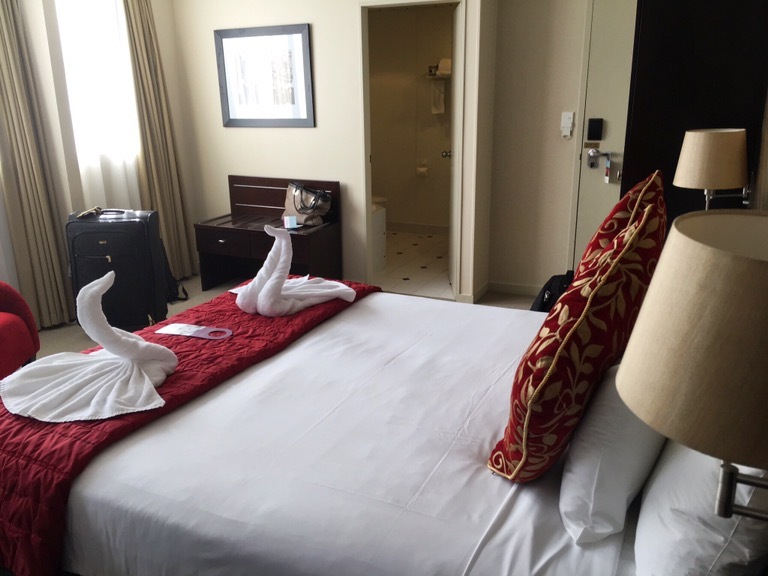 Here we had a suite booked for a very reasonable advance rate. Roomy with a nice sitting area, and access to two bathrooms, it certainly was a very good deal. Unfortunately the restaurant and bar were closed on Sunday nights, however a short stroll brought us to a food court, very close to the hotel. The area is filled with a myriad of colourful food choices. Not far below the food court, we came across Burger Liquor. This was to be tonight’s choice as Hubby loved the menu. The Double Smokey Burger pictured above was Hubbys final choice. Every morsel was savoured. Not a burger fan, I was going to settle for fries until the friendly young wait staff pointed out there were ‘In the Buff’ burgers on the menu. 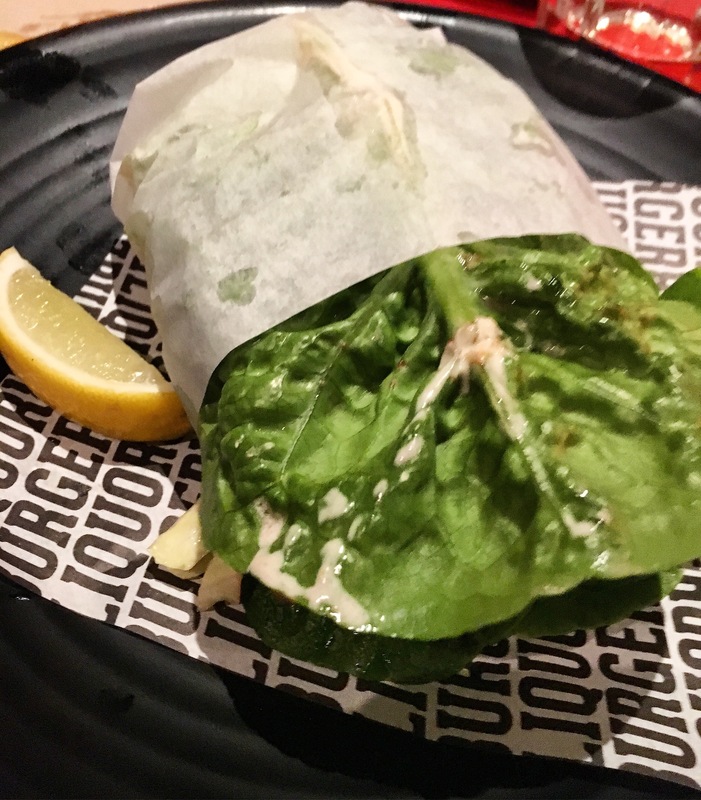 Here the bun is replaced with Lettuce Leaves , encasing all the normal burger ingredients. Let’s try it! Great idea, loved this Baja Fish in the Buff Burger. 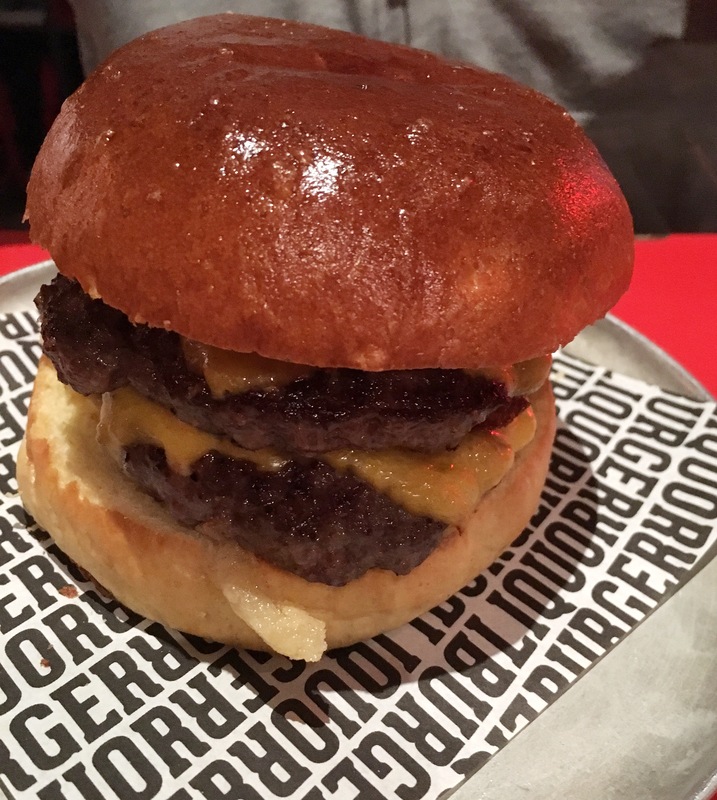 My main reason for not enjoying burgers is just too much bread in the buns, however this meal was filling, tasting and did not feel like you had overloaded on bread. Curlies and the House Poutine were a fitting accompaniment for our burgers. Most delicious, although the three of us at our table were unable to finish. 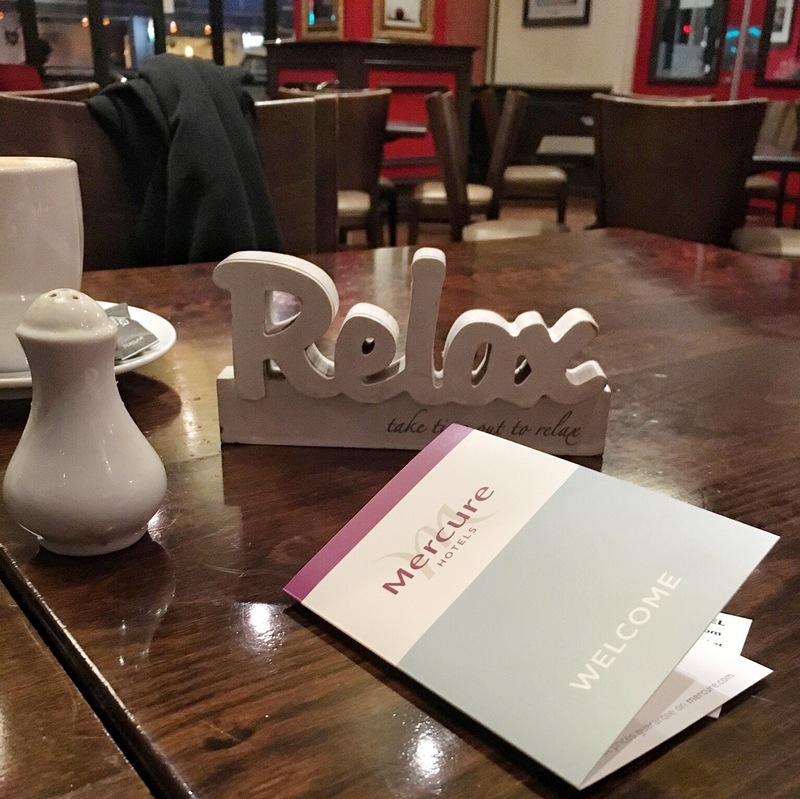 Really enjoyed this venue, quite different from the mainstream, with a funky city feel, obviously popular, quick friendly service and great food quality. Even the condiments were eye catchingly different! What better way to walk off a meal than a wet evening walk through Wellinton. We found plenty to look at, with the city putting on quite a show at night time. 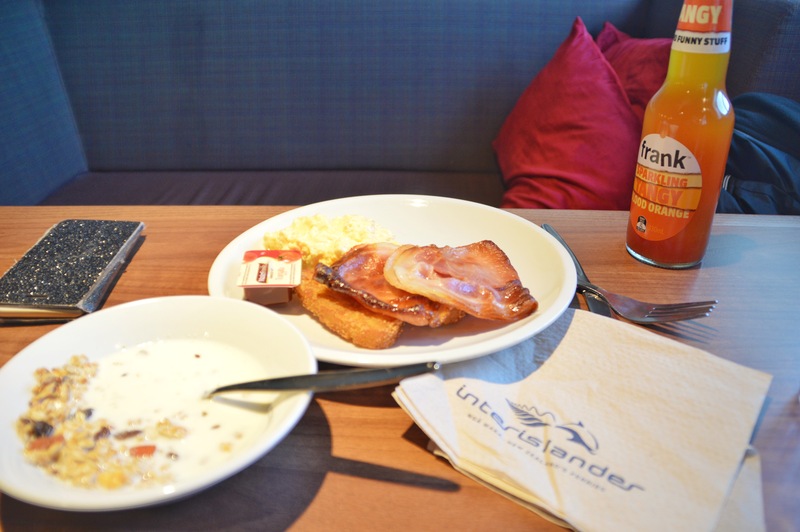 Our comfortable sleep was followed with an included breakfast at the hotel restaurant. Here the full buffet included hot & cold dishes, with juices, tea & coffee. All the food was fresh and enjoyable. 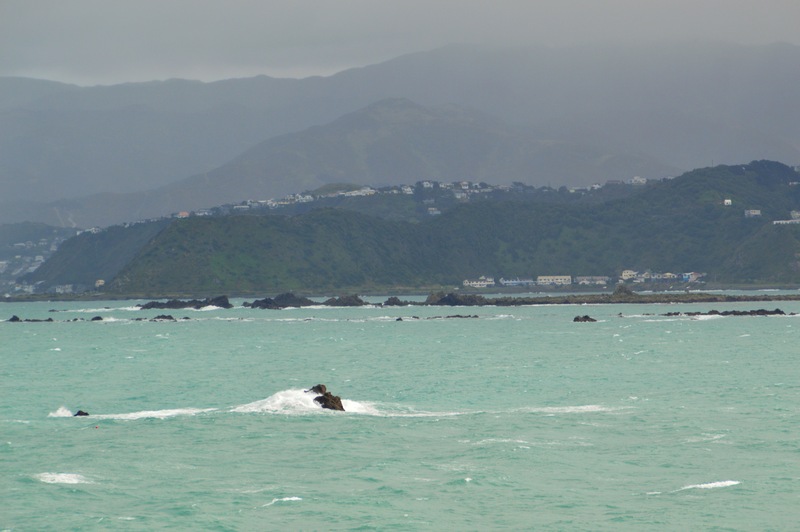 Even though this was a very brief overnight stopover with cold winter rain, we enjoyed our quick look at Wellington. There was no time to visit any of the landmark attractions, however, we did enjoy getting taste of what this city could offer. Check it out sometime! 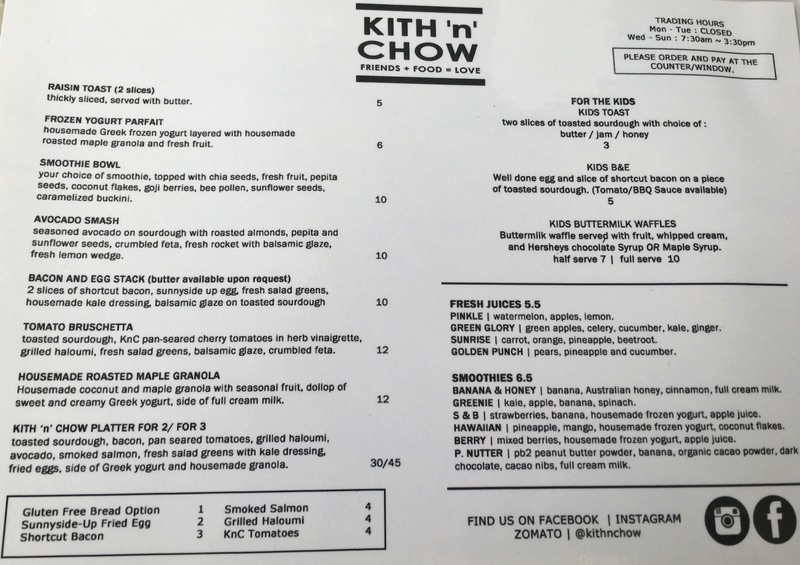 Returning to our Sunday Beeakfast outings, the choice today was the quirky food van Kith ‘n’ Chow, located in Mount Gravatt. Quite an electic choice of seating including this van complete with stools inside and out. A novel table for customers and one which, I have no doubt, is a hit with many. Today was a somewhat moody, wet, Brisbane day, which had us wondering what would happen, given the table settings are outside. We soon discovered there was no problem at all. Why you may ask? Simply because this food van operates in conjunction with a florist next door. The florist shop provides the coffees to accompany the gastronomic delights of the food van. Seated under shelter, we perused the menu to decide upon breakfast choices. 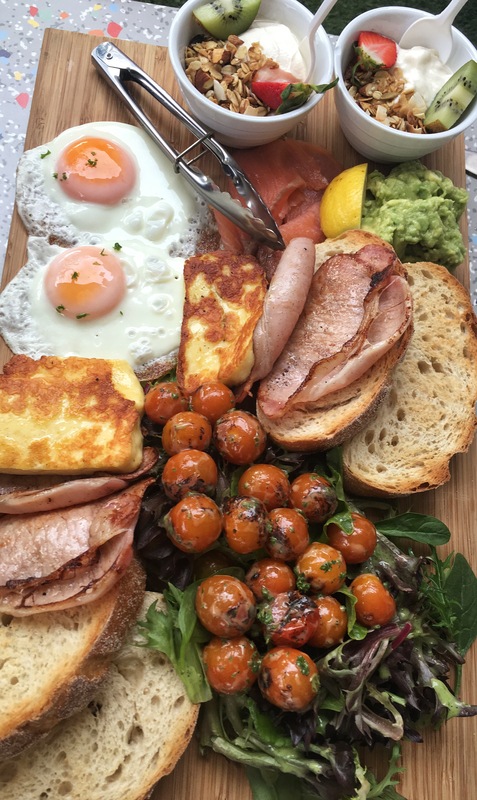 Having seen some photos of the breakfast platters, Hubby was in no doubt what his choice would be- you guessed it a platter. What a simply delightful spread, not only the display, but for the taste sensations contained within. Those cherry tomatoes pan seared in a herb vinaigrette were sensational. Eggs and bacon I’m told were fresh, and the haloumi was a definite favourite of Hubbys. His first time trialling this particular cheese. 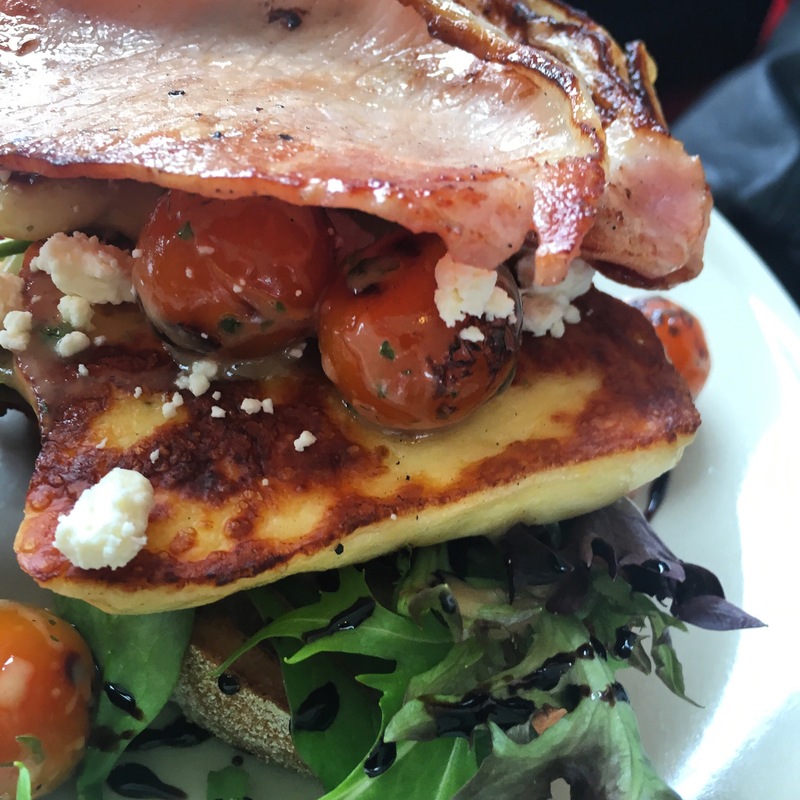 More of those superb cherry tomatoes and grilled haloumi on this tomato bruschetta dish, with an added side of bacon. 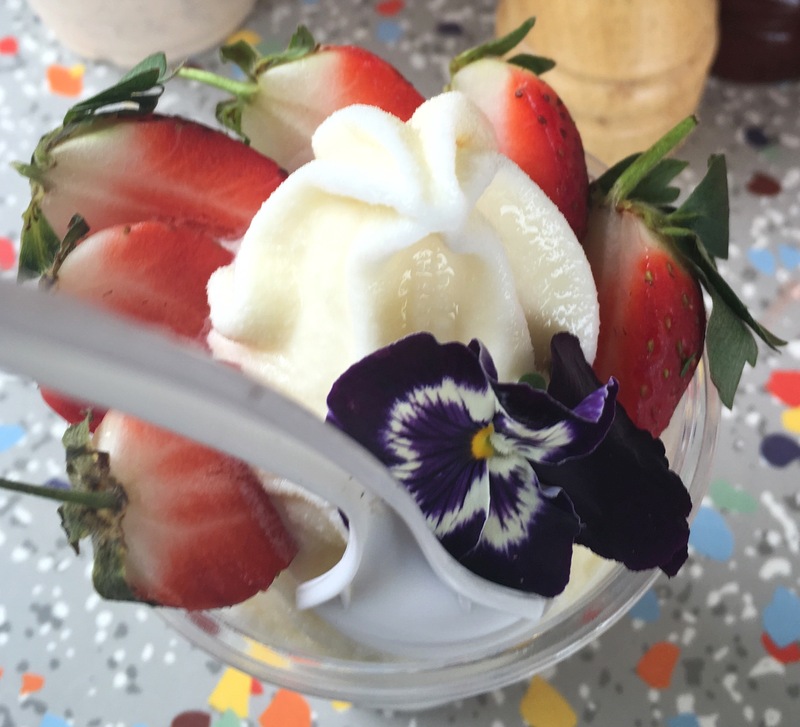 Frozen yoghurt topped with a bright pansy, contained crunchy roasted granola which mixed well with frozen creamy yoghurt and strawberries. 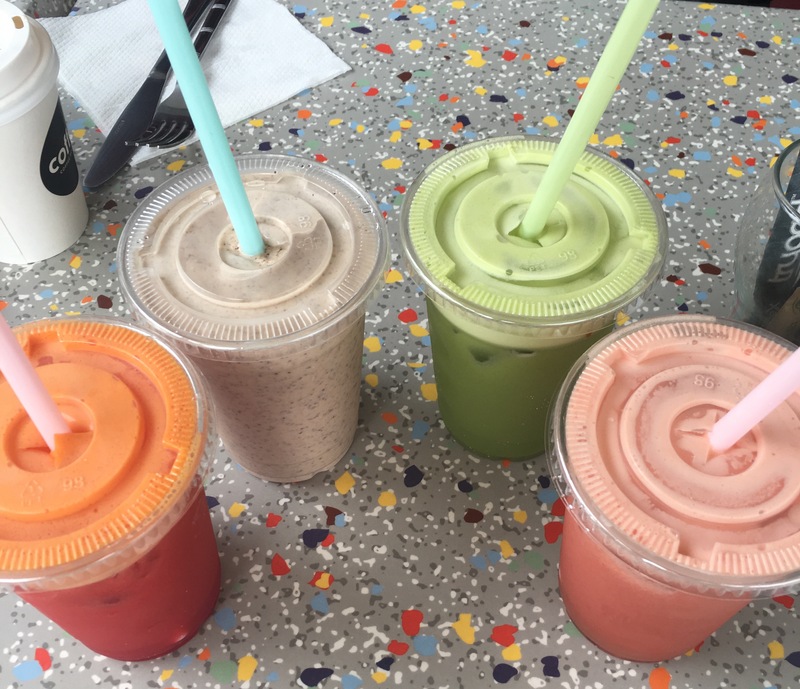 Juices and Smoothies are offered on the drinks menu. The choice, like the food menus, has been keep to a small yet varied number of choices. Sunrise Juice, P nutter Smoothie, Green Glory and Pinkle. My choice was the Pinkle, a very refreshing light, tasty juice where the watermelon apple and lemon mixed nicely to gently tease the tastebuds. Take the time to visit this interesting cafe. 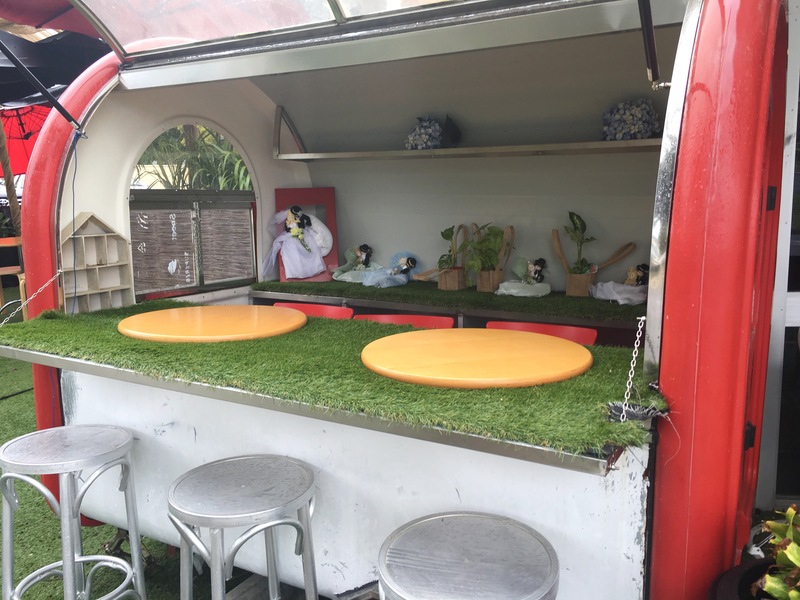 The idea of incorporating a quaint food van into the area looks to have paid off, It certainly creates a talking point, and they have in no way skimped on the quality and presentation of their food. 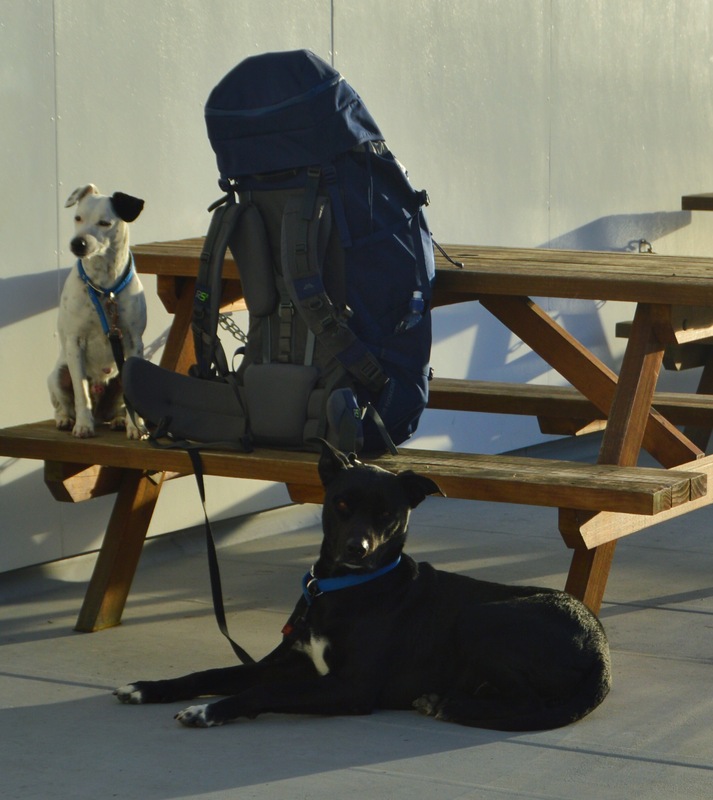 Even these canines were to travel on the ferry on the same August day we did. Both guarded Dads luggage whilst waiting on him to return outside. 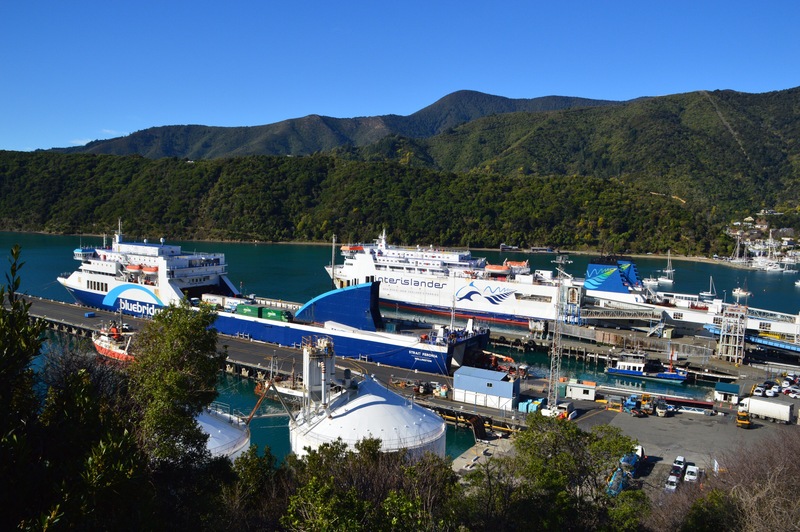 Today we would travel from Picton to Wellington on the Interisland Ferry. As the trip was a bit over three hours, we had decided to trial the Premium Lounge. Advertised as comfortable, over 18 only, with food and beverage supplied for the duration of the trip, the concept certainly appealed. Certainly comfortable, we were actually impressed with what the lounge provided. 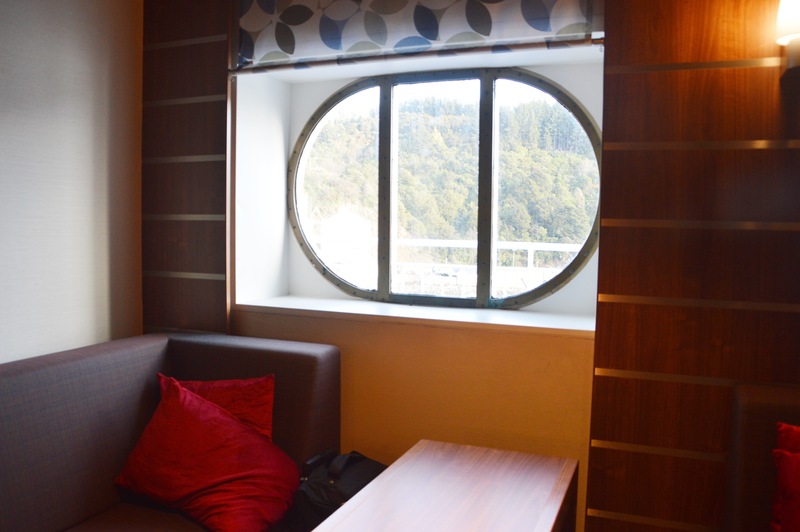 Plenty of seating choice, from comfy lounge to dining suites, and booths next to the portholes. Today we chose the porthole seating which looked so very inviting as well as allowing enough room to sprawl out a bit. On top of that we at least had a view of the stunning Marlborough Sounds as we glided past. Yes we were lucky on this trip as the infamous Cook Stait was not as rough as it has been know to be. This stretch of water divides the South & North Islands of New Zealand and has a reputation for being challenging to cross at times. 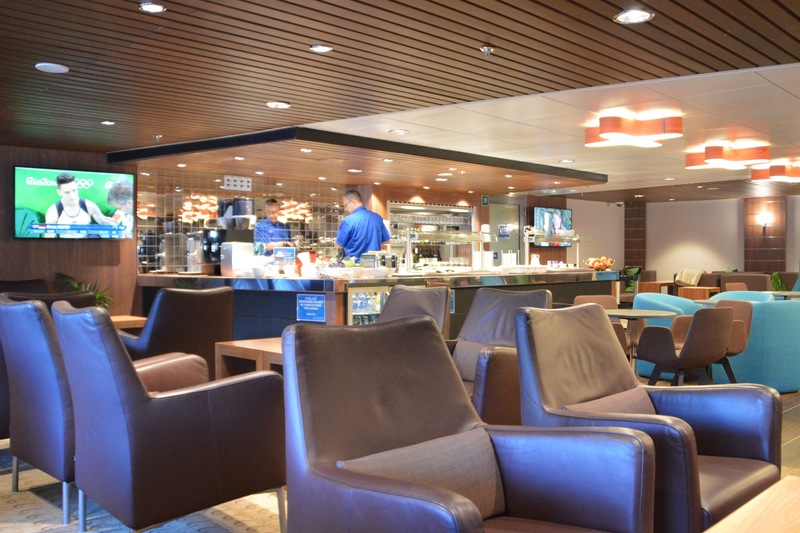 An added bonus of the Premium Lounge, is the location, towards the middle of ship. The bow and stern tend to take most of the motion, whilst the middle stays more stable. From the time we entered the lounge, to the time we disembarked, there was an endless supply of food on offer. Firstly a buffet hot/cold breakfast, followed by scones, jam & cream, then an assortment which included sandwiches. Help yourself to the bar fridges for water, soft drinks etc. With coffee/tea on offer plus a stocked bar enabling you to enjoy a relaxing drink later in the day, there really was something for everyone’s tastes. All the food we sampled was fresh, hot or cold if were meant to be, and overall, quite nice. Leaving Picton as we headed down through the Marlborough Sounds for around an hour of scenery before hitting the open sea, photo opportunities abound. The location of the Premiun Lounge, is very close to a door which takes you out to deck. 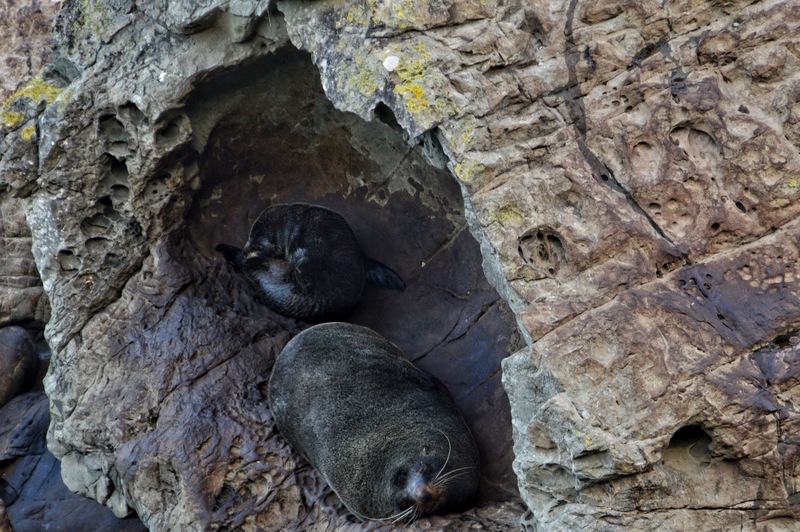 Whilst cruising the Sounds, it was no problem to pop out, enjoy the scenery and snap a few shots. A couple of times during the trip, we passed ferries heading in the opposite direction. As we neared the last of the South Islands land mass, the brilliant blue clear waters merged into the the subdued hues of Cook Strait. Surprisingly, there is actually a short distance between the tips of land on each island. In fact for a while during the trip, you can see both islands. Certainly the sea was more choppy through the Strait, however it did not affect us much in the lounge at all luckily. Especially as we heard the staff commenting on the number of seasick travellers in the front viewing lounge. The weather did deteriorate somewhat as we neared Wellington, and after battling the strong wind outside, I decided it might wise to continue the trip from the comfort of the lounge. Good Choice! One interesting discovery upon booking these tickets a few months previously, was the online booking choice of laybying your tickets prior to the trip. Not something I had come across before but certainly something which could well appeal to others, particularly those travelling on a budget. A mention to the staff onboard and at the Picton Ferry Terminal. All staff we encountered were friendly, helpful and professional. Certainly no problems there at all. A ferry trip between the islands is something you should try. With any luck you too will be lucky enough to have a nice smooth sailing. For that little bit extra why not add the Premium lounge. We found it well worthwhile. 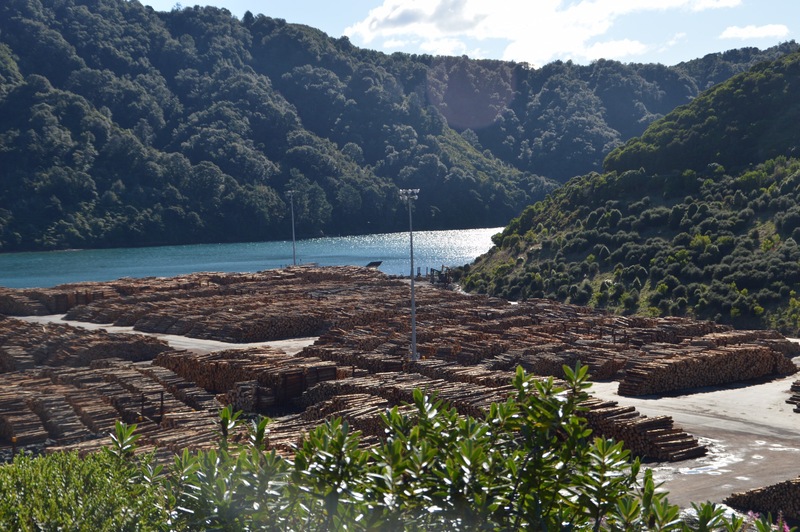 Watch for the Wellington and North Island blogs still to come. Thank you also to all the Dine Live Travel followers on Instagram, Facebook and Snapchat! Hidden in the Upper Moutere is an awesome venue. 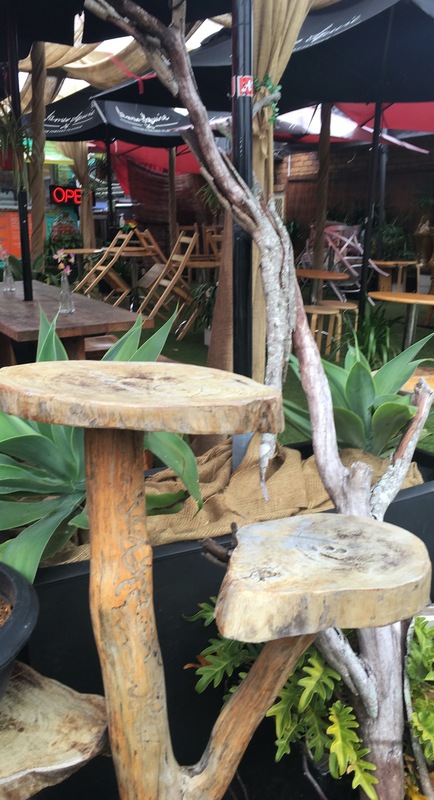 Located on the grounds of the Moutere Hills Vinneyard is the Fox n Grapes Wine Bar. 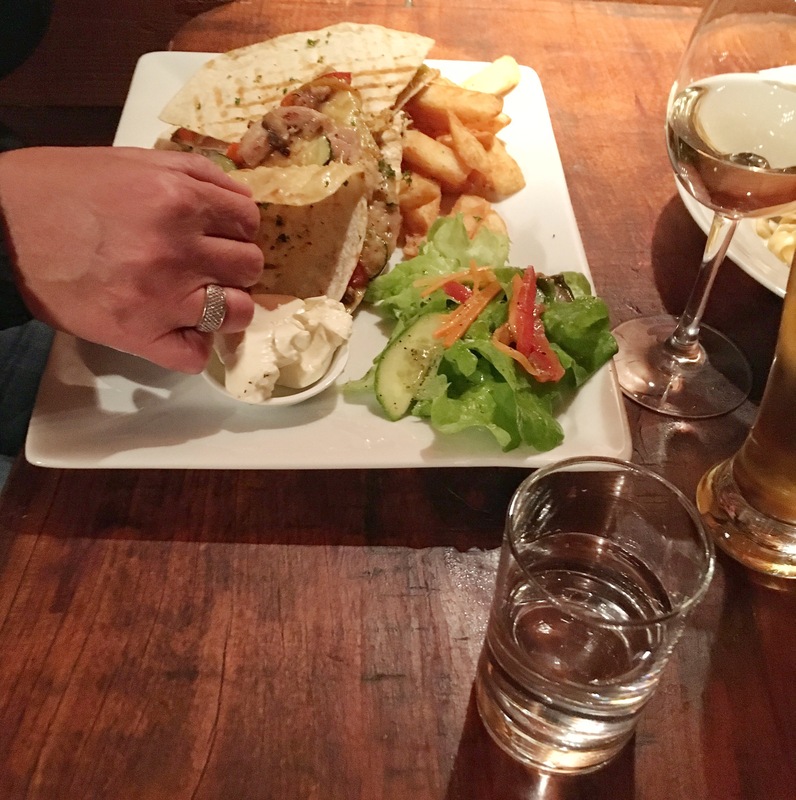 Open on Friday evenings, locals are loving this hidden delight. 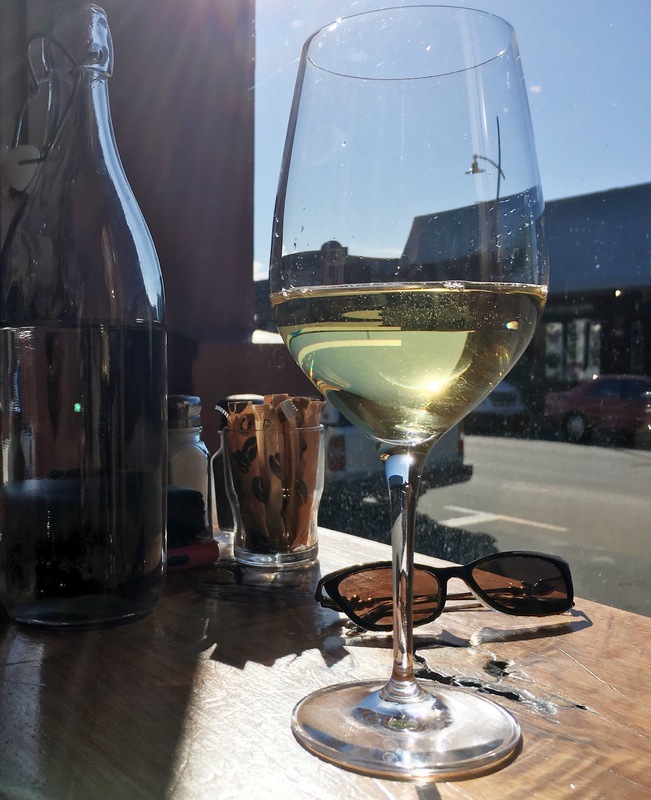 We were lucky to be staying in the area, with a Friday night included in our stopover, therefore we were not going to argue with local knowledge recommending this as the venue for Friday Night dinner & drinks. Loved how the family were your hosts for the evening and we were surprised at how busy this little venue was. What a great idea to convert an old hops barn into an awesome venue! 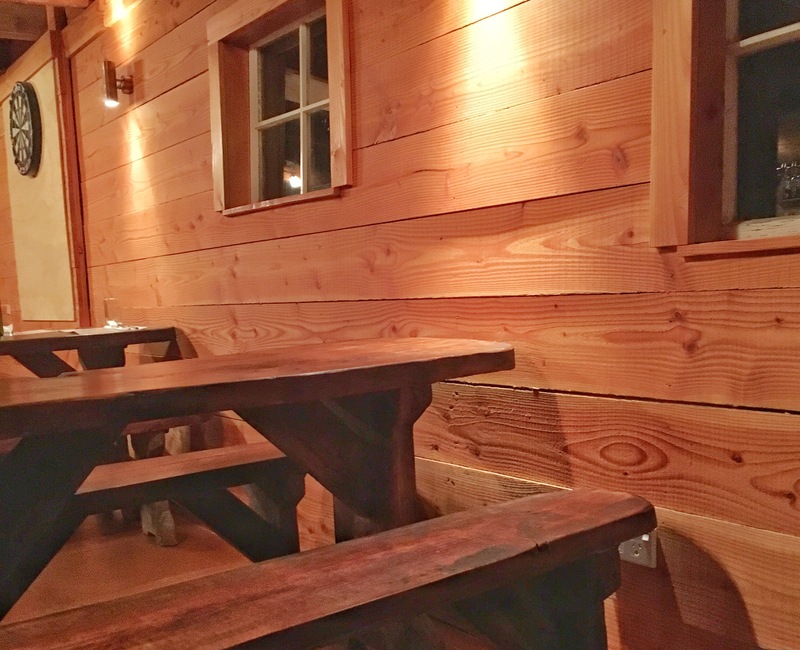 With tables, lounge area and bar stools there’s something here for everyone. Subtle lighting, highlights the wooden interior. On a cold winters night, this venue was not only warmly inviting but very homely in its feel. Those family members who were operating the venue tonight were simply awesome. Personalised friendly helpful service. 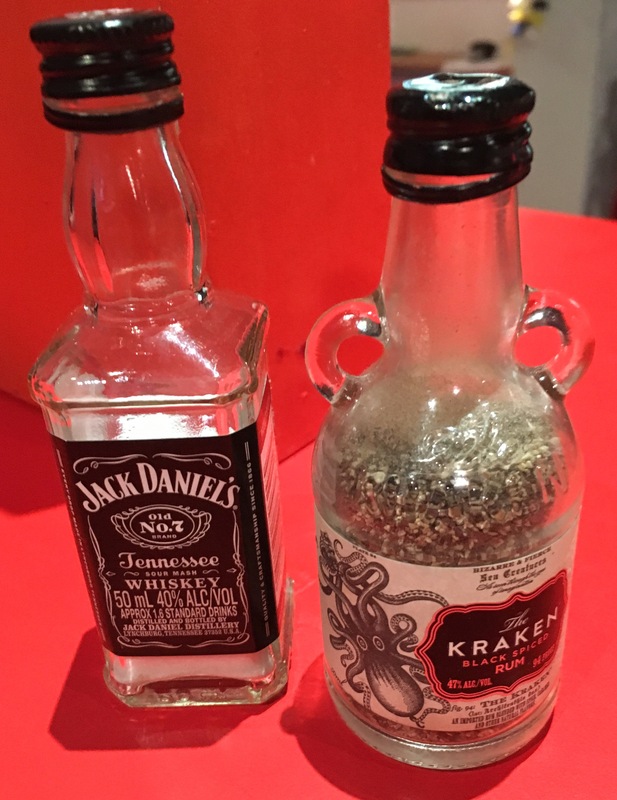 Going out of their way to make your experience even more pleasurable, even if that meant sharing a drink with patrons at the bar. Loved that touch! I chose the lamb salad which was absolutely devine. 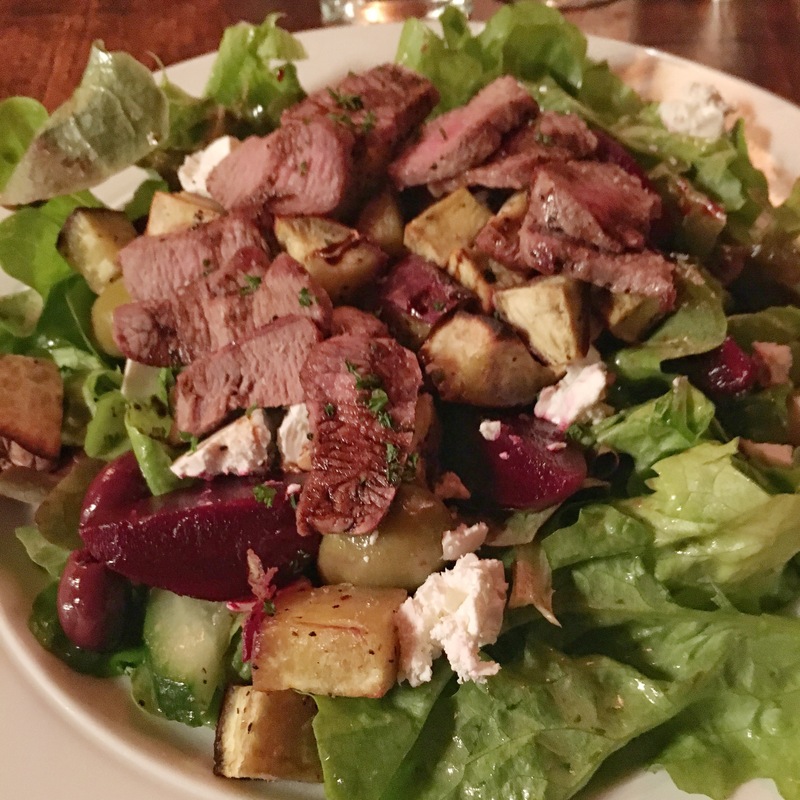 I’m not a big beetroot fan, however, combined with the lamb and salad, plus not too much beetroot, I have to admit, it did partner well with the overall dish. 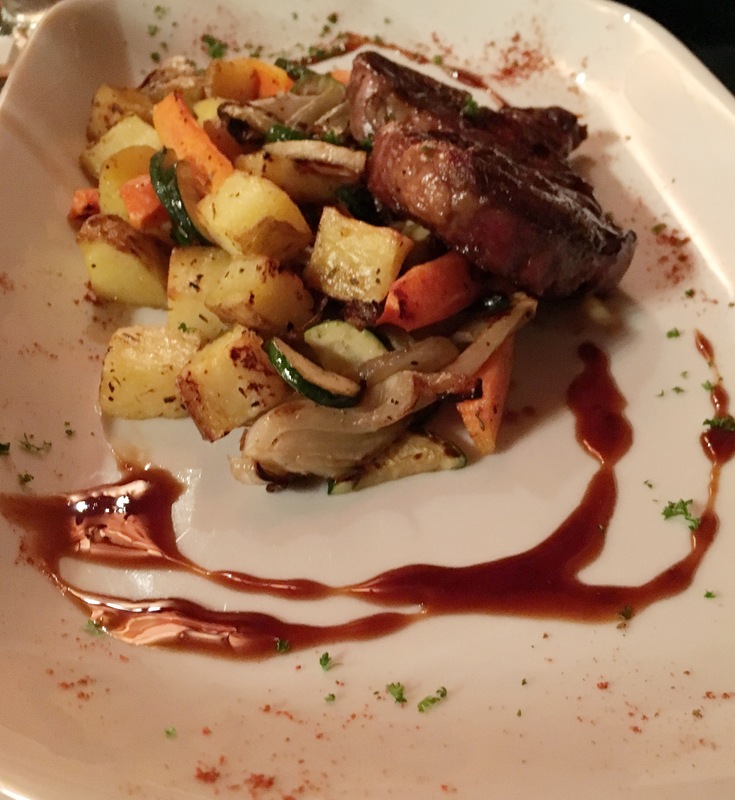 Hubby tried the Scotch Fillet and loved it…..
How delicious does this beef and fried potatoes look? Like a roast vege salad – don’t tell Hubby he actually had a salad :). 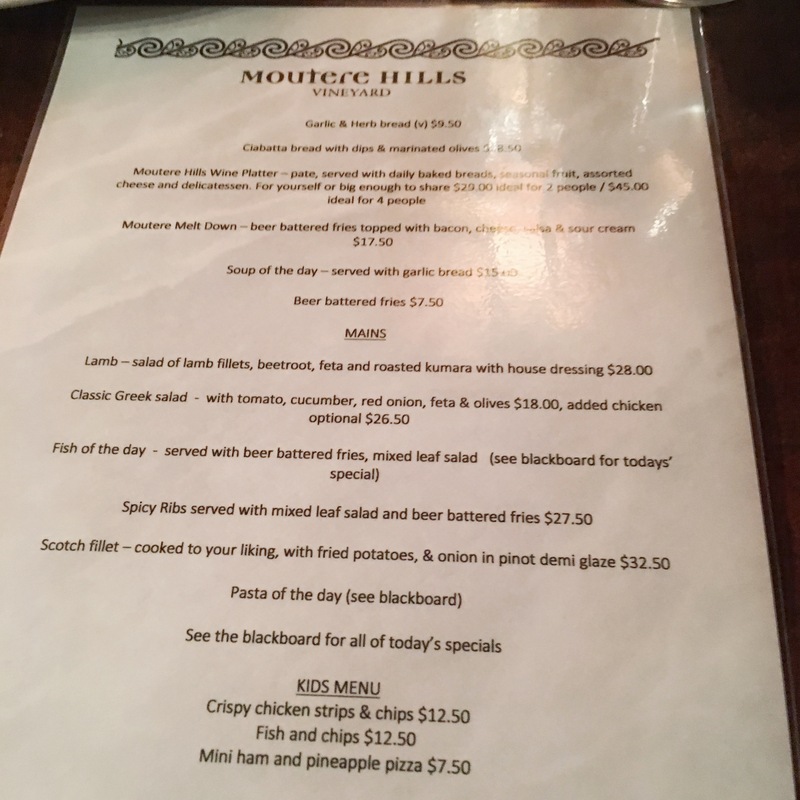 We were lucky this worked into a Friday night, however it if doesn’t for you, make sure you visit the Moutere Hills Vineyard and Cafe. Overall the whole venue has had a lot of thought and hard work put into it. Their wines are certainly worth tasting, very nice. Stop by for a visit, you won’t be disappointed. 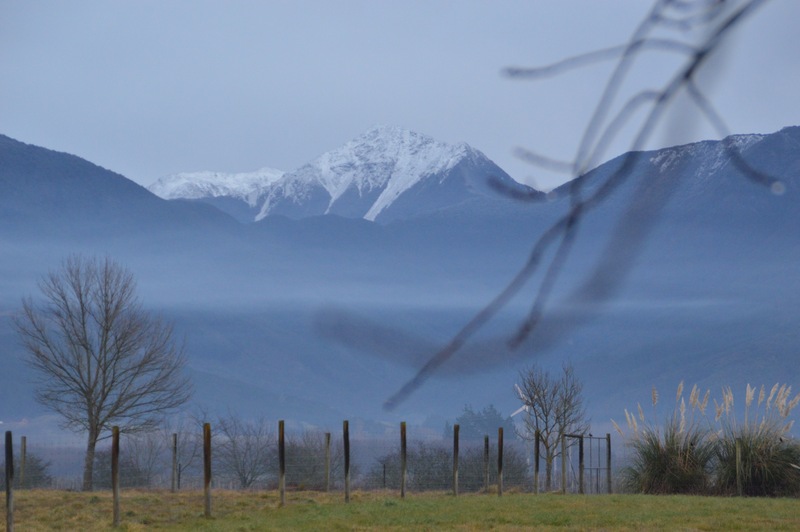 Our drive to Nelson was via the Wairau Valley, with a visit to Saint Arnaud. Near St Arnaud, lies the Rainbow Skified. 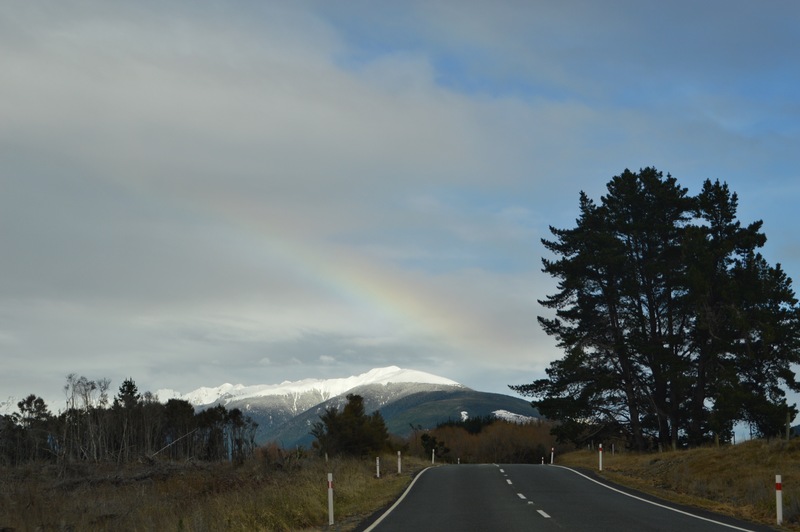 As we rounded a corner towards St Arnaud, it was very fitting to see a Rainbow over the its namesake Skifield! You can’t drive this way through to the province of Nelson, without a stop at Lake Rotoiti which is only a mere few kilometres past the turnoff to Nelson. 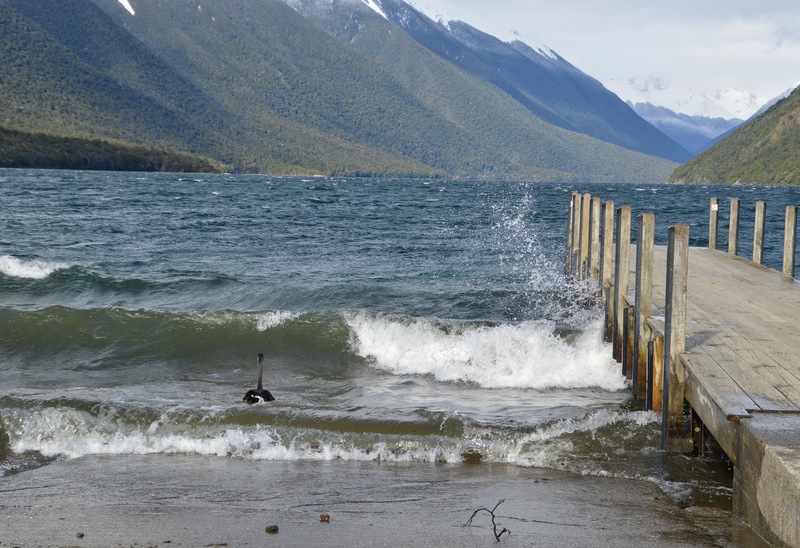 Right in the township of St Arnaud is the entry to the Lake. Very popular in the summer, with the area offering incredible photo opportunities at any time of the year. Today the wind cut right through to the bone marrow, even with layers of clothing. 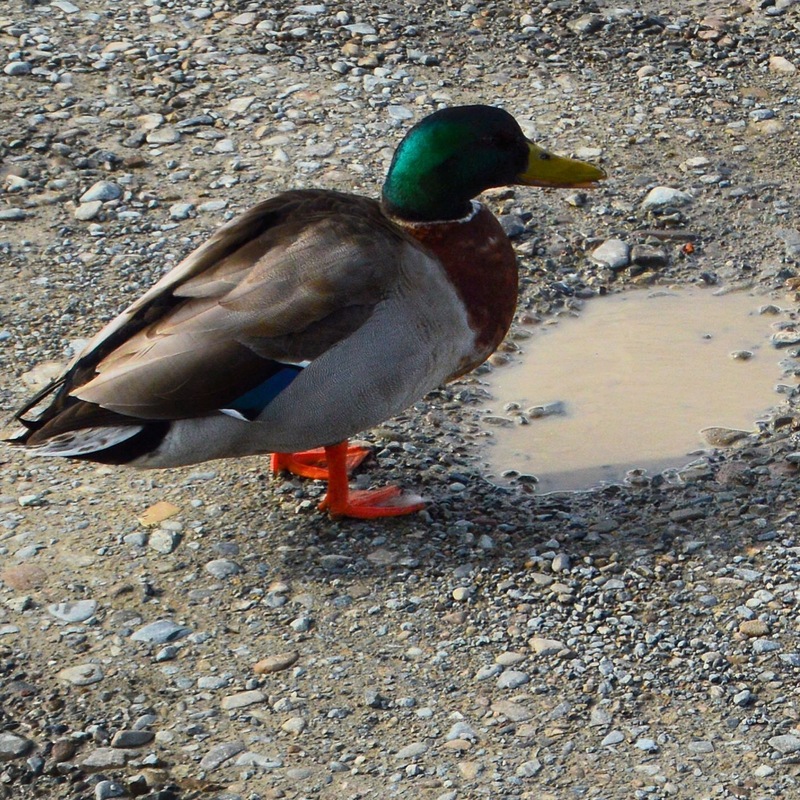 Only the residents seem unperturbed, but then I guess if you’re a somewhat portly duck with a thick coat of feathers, who has become accustomed to the weather, it probably isn’t an issue. There was no shortage of ducks and drakes with a sprinkling of swans. All so used to interacting with humans, they didn’t bother to get out of your way. Obviously so well fed, there were no demands for food, although I’m sure if food was offered to any of this lot, it would be consumed forthwith. We stopped off for a warming cuppa at the servo in St Arnaud. Elaine’s Cafe was warm and well sheltered from the bitter wind. I’m sure those outdoor tables would be very inviting in the summer, this time however, we barely noted them, scurrying past to enter the warm building. Aaah, so much better! 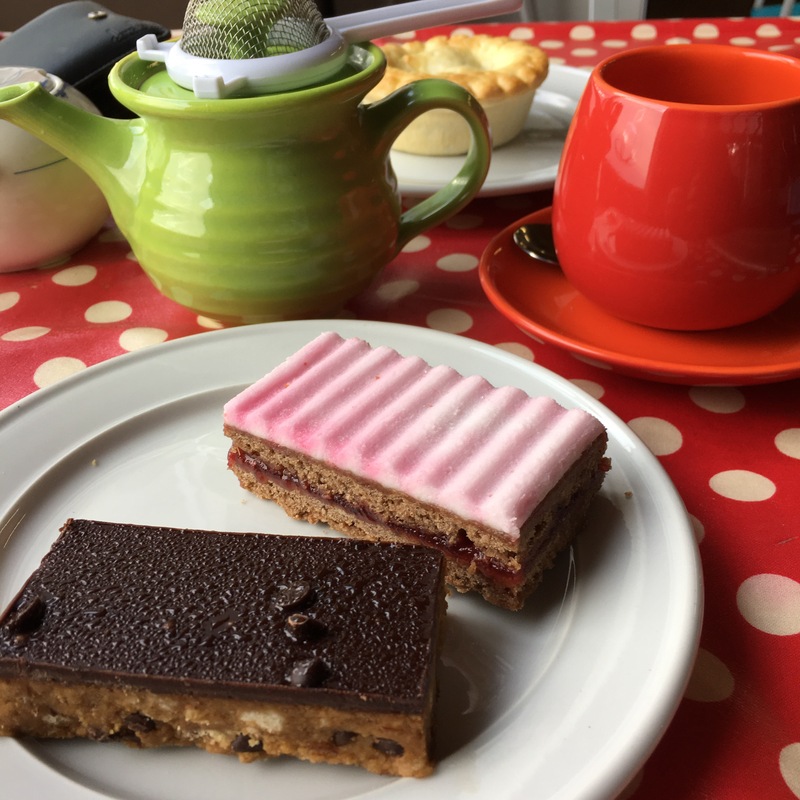 Our sneaky morning tea was simply delicious, and did I mention warming? ?? Down to earth service, hot, hot drinks, delicious food, and the topper for me, tea leaves instead of tea bags. Well done! Continuing our drive towards Nelson, we were immensely happy to be encased in a warm vehicle again, having been warmed to the core with the morning tea stopover. Our next couple of days in Nelson included a nice drive around the area. 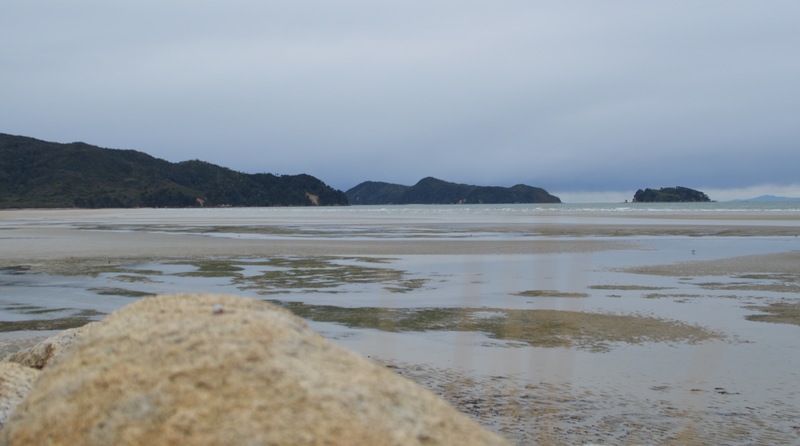 First stop, Tahunanui Beach, with sand stretching towards the port and Nelson city providing a backdrop, there is a lot to see around this area. In the summer this is another popular area, overflowing with tourists and locals alike. 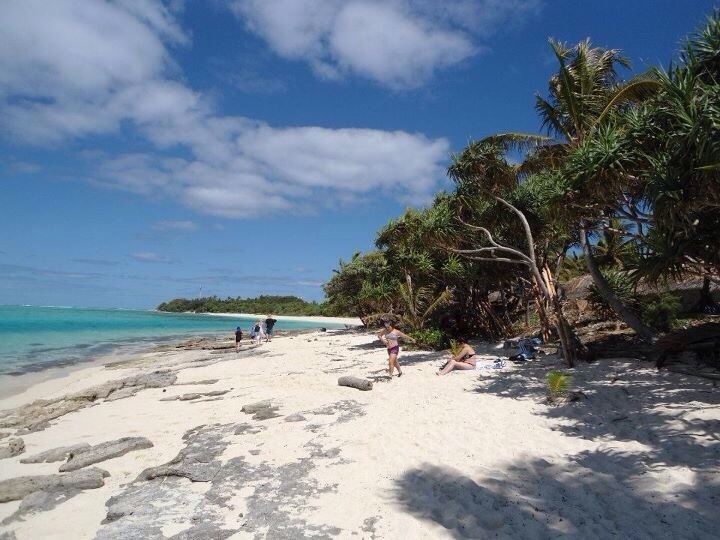 Swimming slides, playgrounds, Natureland, plus the bonus of this fabulous beach. 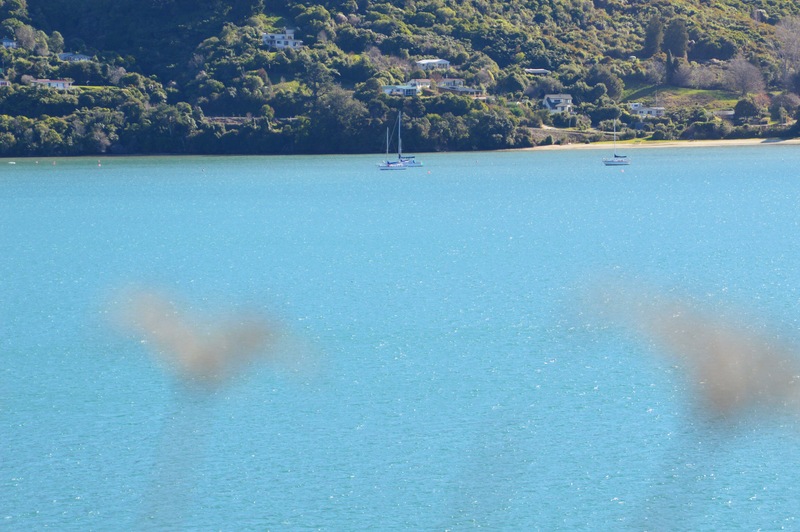 Tahunanui has plenty for all. For those wanting a nice stroll and peace & quiet, then winter time seemed to be the time to visit. Very few people around and still those fabulous views.walk and photo shoot After a quick walk and photo shoot, we headed into the city itself, looking for somewhere nice for lunch. Today’s choice was a neat little venue, Sprig and Fern, in the main city itself. 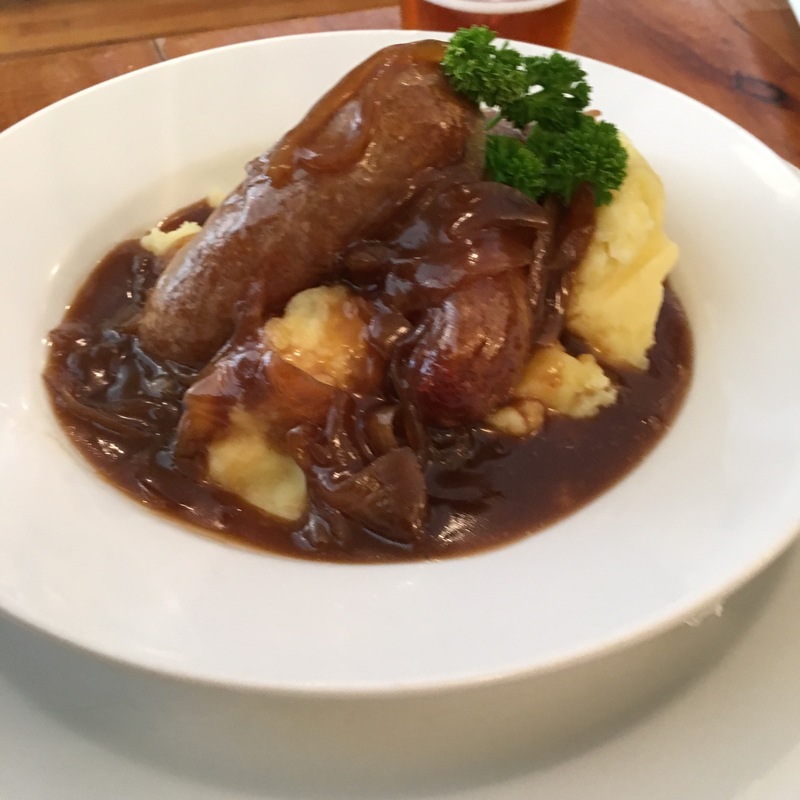 Here $10 meals were on offer which saw hubby indulging in one of his favourites, bangers & mash. Keep in mind it was winter during our visit, in fact the middle of August. Therefore you may consider the next decision somewhat strange. Off to visit Mapua, were informed that this was the place to enjoy an awesome ice cream. Ok why not. Let’s do it! Loved this ice cream! 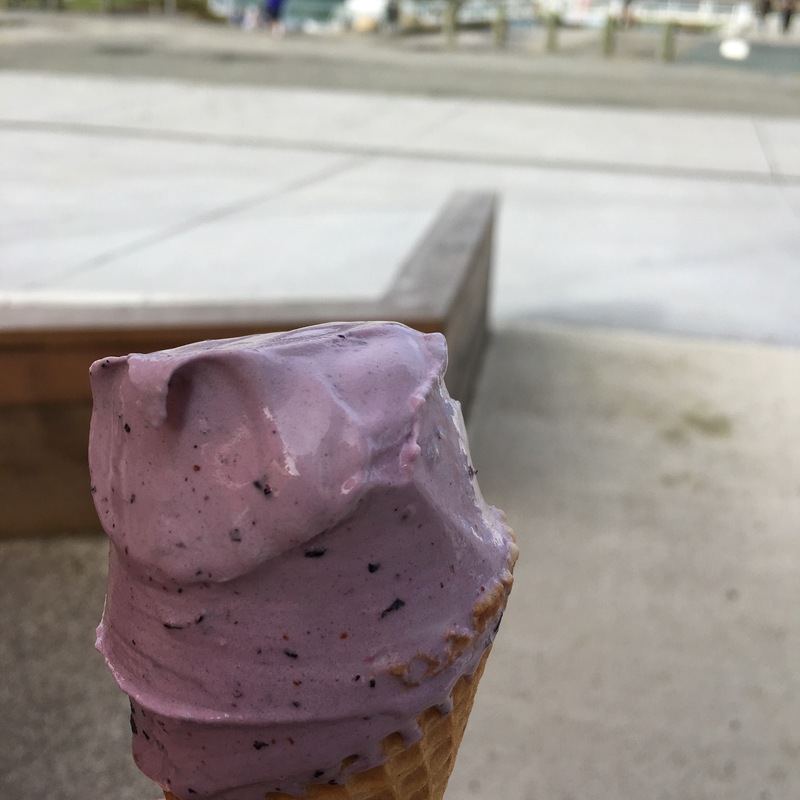 As we watched the local ferry battle the outgoing tide whilst returning from Rabbit Island, we consumed these delightful treats from Alberta’s at Mapua Wharf. Yes I’m cold now, but it was nice! Mapua is a beautiful area. Clean, tidy with a delightful wharf, a short little ferry trip over to rabbit island and overall a nice clean part of the Nelson/Tasman province to visit. 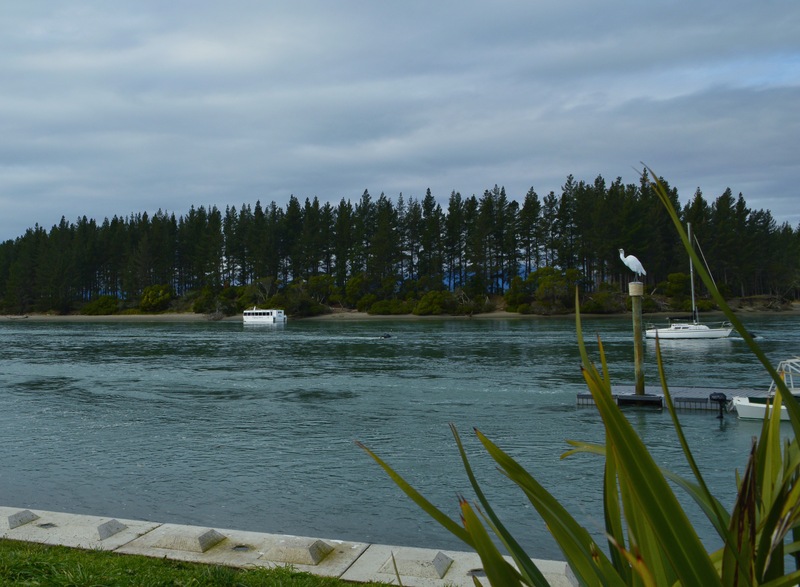 We were informed there is a bicycle track which runs from Nelson city through to Rabbit Island. 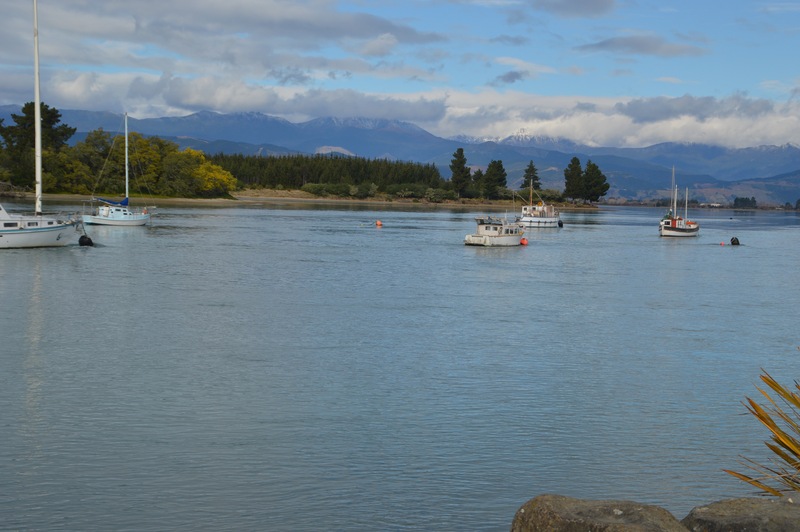 Here the ferry meets you and delivers you in a quick few minutes to Mapua Wharf. Fabulous idea for those who enjoy their cycling. Keep this in mind cyclists! 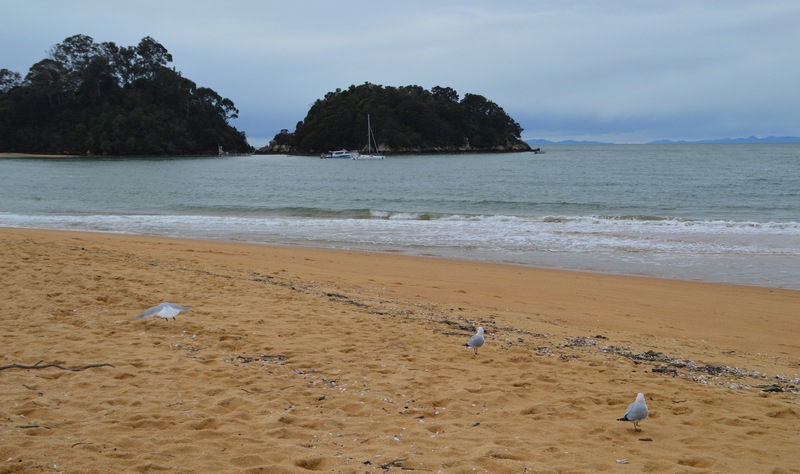 Before we returned to base, our local guides took us for a scenic drive through Kaiteriteri and really, Just look at the sand, this tells the story. Pure gold. last stop was Marahau. 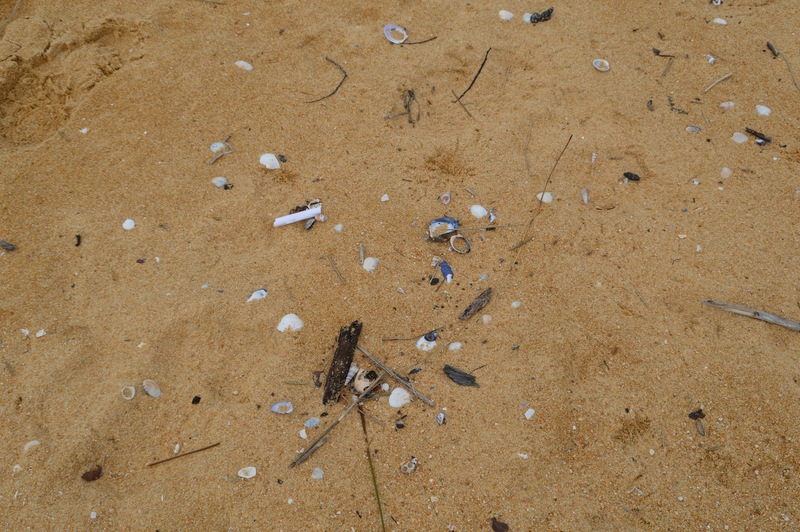 Devoid of human life on the foreshore, peaceful, beautiful. Before this blog closes, watch for the review on a hidden Upper Moutere Winery- it’s a gem! You need to visit these areas, it’s pure, natural, rugged, and there. It’s New Zealand. Boardered by rugged mountains on one side, open ocean stretching further than the eye can see on the other, lies the township of Kaikoura. The State Highway runs between the mountain range and the sea, providing access to Kaikoura from the South and the North. 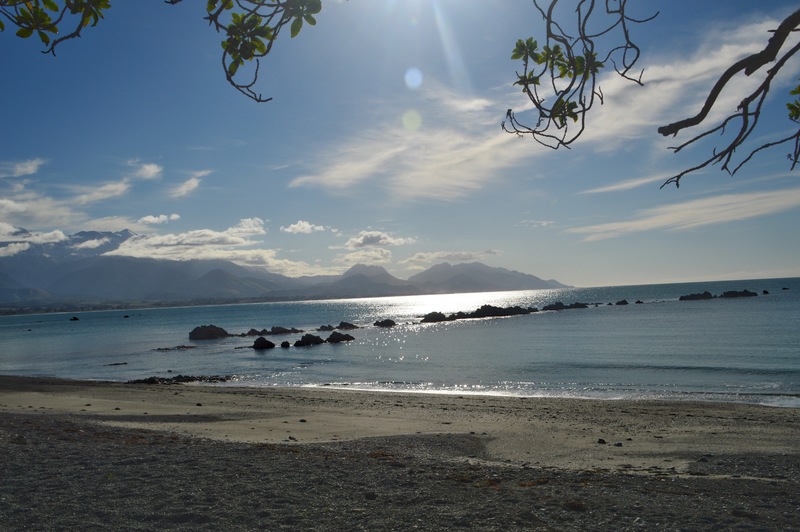 With limited time to spare, we chose a day trip from Blenheim to Kaikoura. A very easy day drive, less than 2 hours each way. 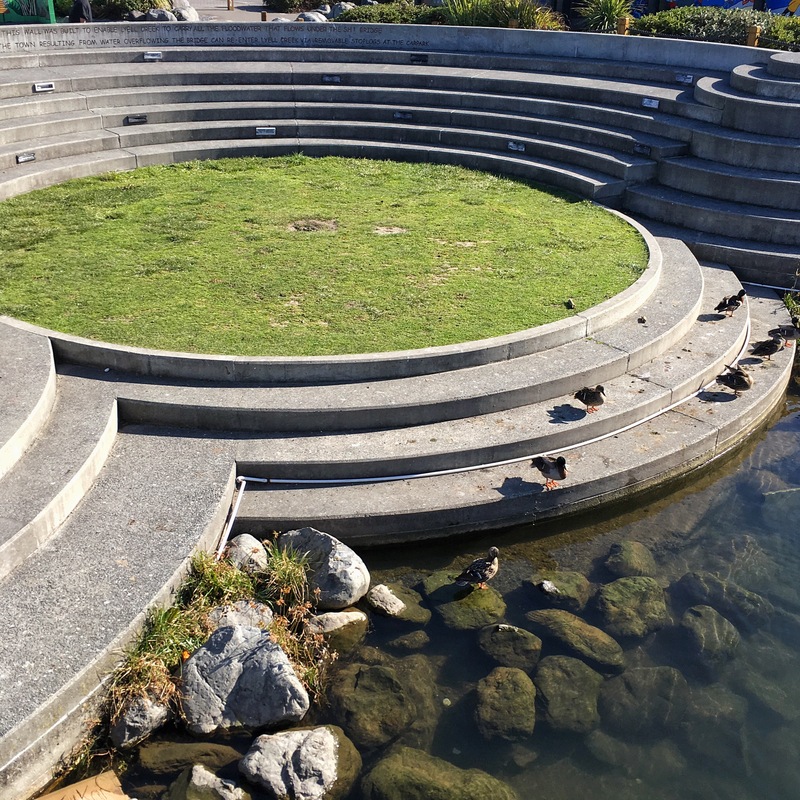 However if you have a little more time, make this stunning area a place to stop over. Coming in from the North, we were greeted with spectacular scenery, as in the photos. Suddenly from a road winding next to the sea, we turned the corner onto a straight, where your first reaction is “Wow”! Really the photos do not do the area justice especially as sheer, snow topped mountains sprang into view. 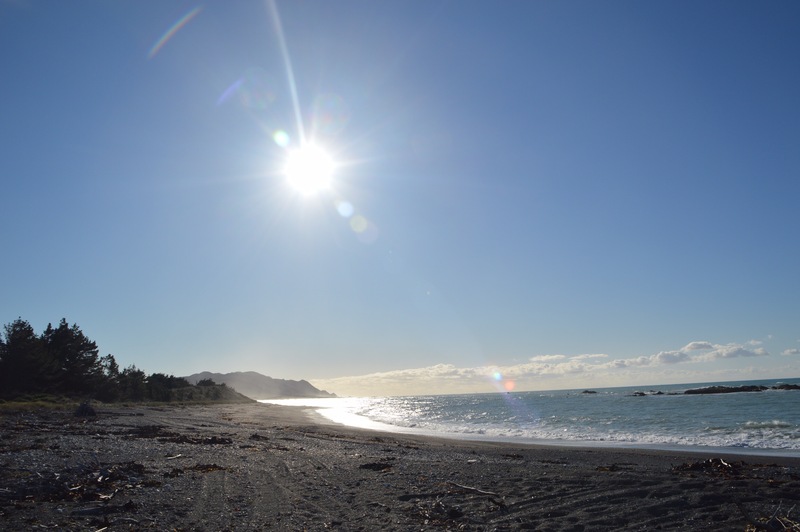 With its name meaning “Meal of Crayfish”, it is no wonder Kaikoura is renown for its Crayfish. Unfortunately for Hubby it was the wrong time of year for the fresh Crayfish however, so he missed out on this round. Next visit though, we will ensure we have better timing to enjoy the fresh ones! Time to stretch the legs, with a wander on the foreshore to drink in the beauty of these vistas, before strolling back through the township itself. Luckily for us we had chosen one of the most beautiful days to visit. Yes it was chilly, however the sea itself stretched out before us, amazingly flat with the smallest waves lazily lapping the sandy beach. Another plus was the sheer lack of people enjoying the area. Certainly nothing was crowded here, although this may be different at times of the high tourist seasons. After walking up an appetite, it was time to seek a venue for lunch. The Main Street was sprinkled with cafes, a few were shut for the off season, one pub didn’t actually open until 3pm. 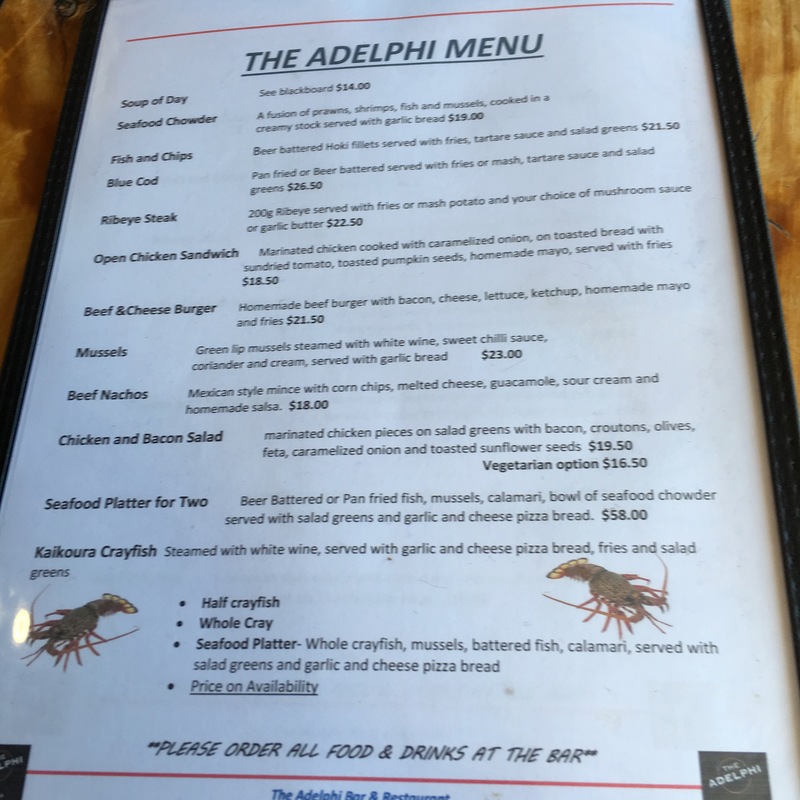 We did however decide upon the Adelphi Hotel. Here the welcoming, enclosed balcony looked like a nice sunny, sheltered place away from the chill breeze. 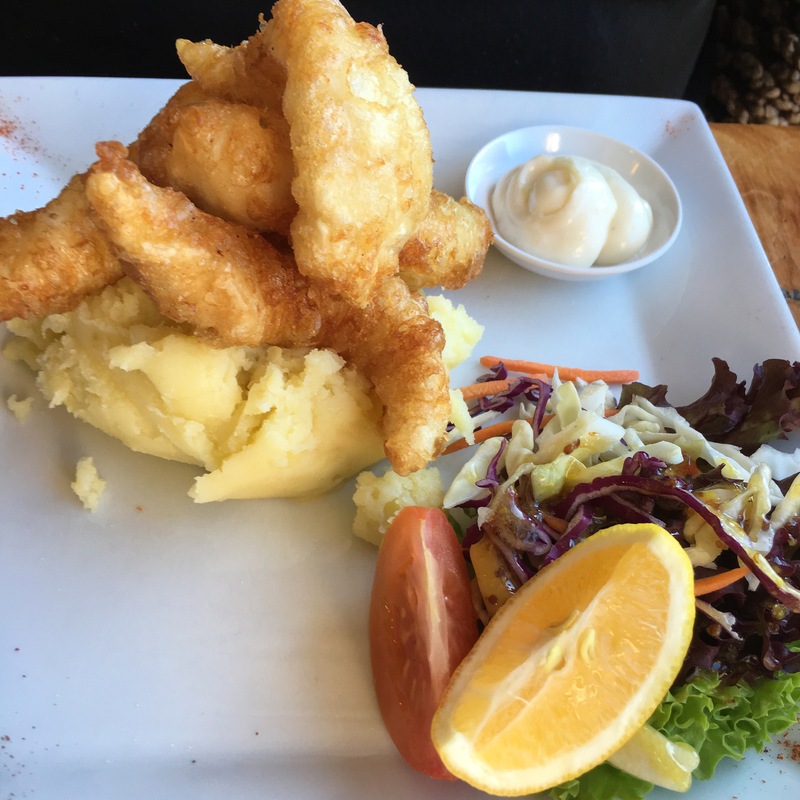 Both of us decided upon the Blue cod, one battered with mash, one pan fried. 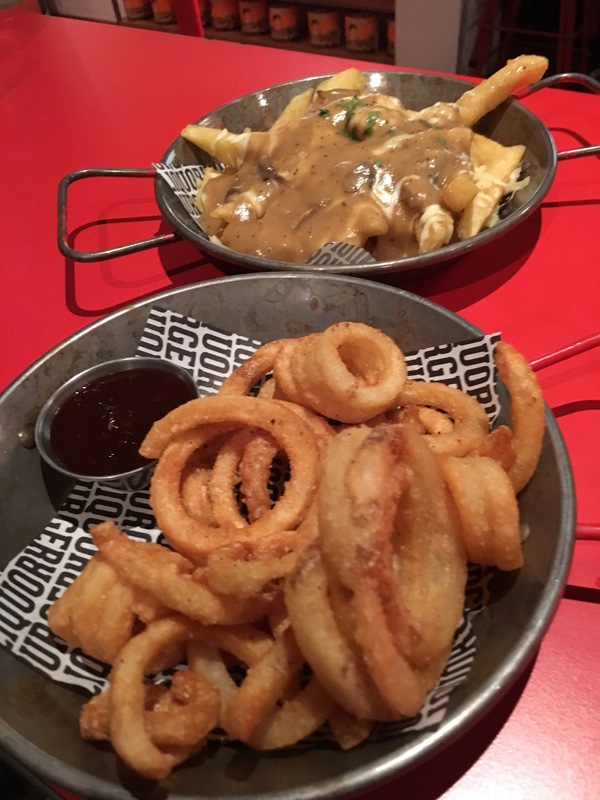 We made the right choice, both of these meals were delicious! The pan fried blue cod was delightfully light and a pleasure to eat. 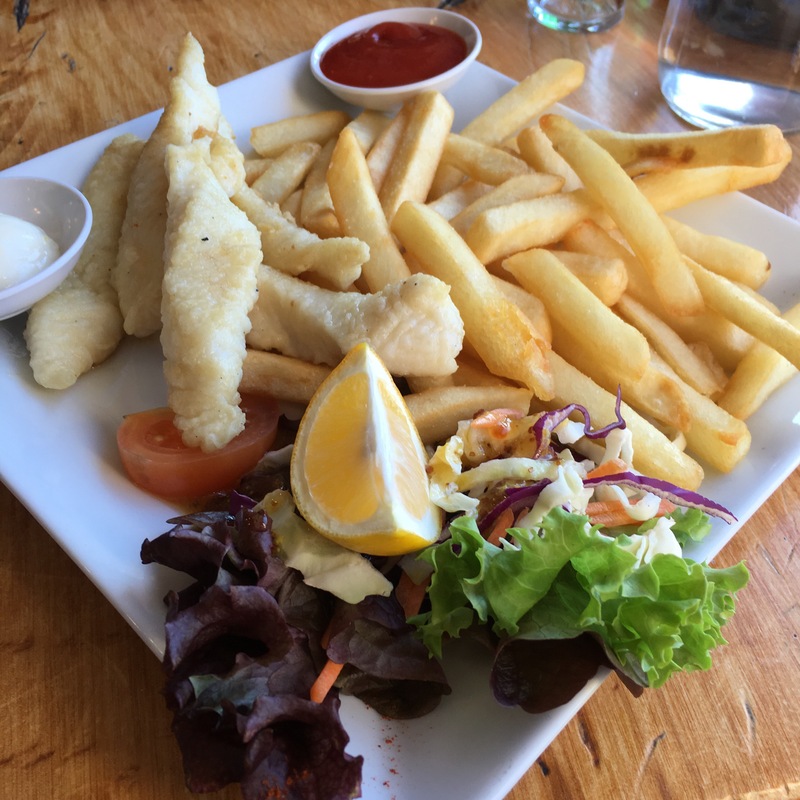 Hubby loved his battered cod and, thankfully, assisted with the consumption of my chips. Our decision to enjoy a quiet meal and drink in the Adelphi was a good choice. Here you could watch the world go by, without feeling cold. In fact the winter sun rays filtering through the window, warmed you through to the bone marrow. Eventually it was time to head back to Blenheim. As much as we had enjoyed our outing, we just did have the time to linger. However if you do, there are a number of activities you can check out in the local area. 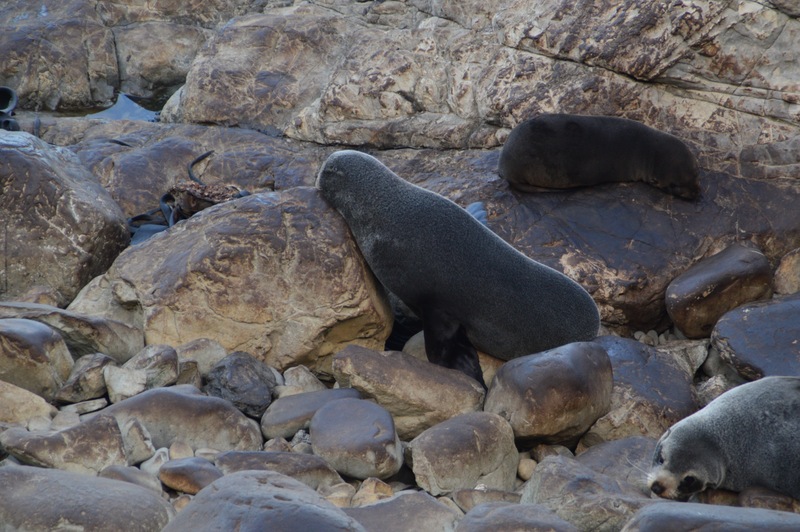 Others chose a more comfortable setting… Pay a visit to Kaikoura, even if it is just a brief stop. There’s a lot to see, and it strikes you as one of those areas you need to see in all weathers. 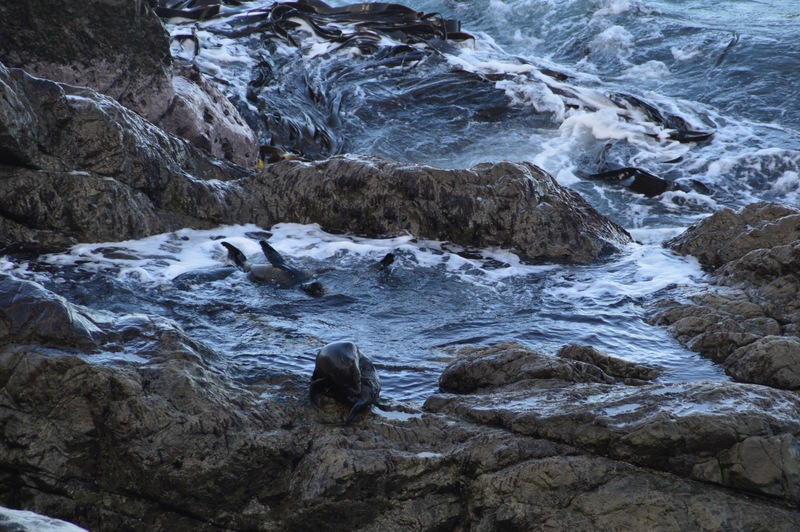 As well as the township, don’t forget to check out the seals. Great free entertainment for all! World renown for Savignon Blanc, green lip mussels, stunning scenery, crayfish, wineries, and more . This area is a must visit. Like an oil painting, the canvas of mud flats at Havelock, roll into the distance, providing a different view of one of the Sounds entrances. Every part of region varies greatly. Here you will find everything from sandy to gravel rugged beaches, rolling foot hills to mountains, beautiful sounds sea waters to pounding coastal waves, long valley roads to those that wind their way around the hills. As you round every, corner a new vista awaits. 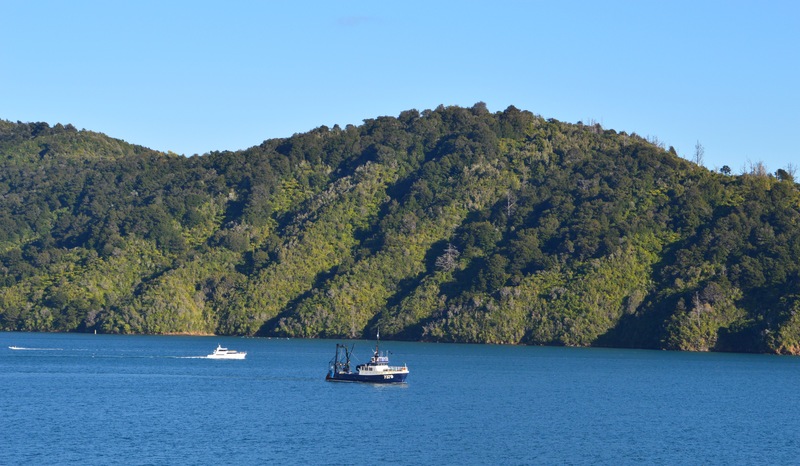 Travel through the Queen Chalotte Drive from Havelock to Picton, ensuring you allow plenty of time to stop along the way/. You will have to stop to drink in the pure beauty of the area. 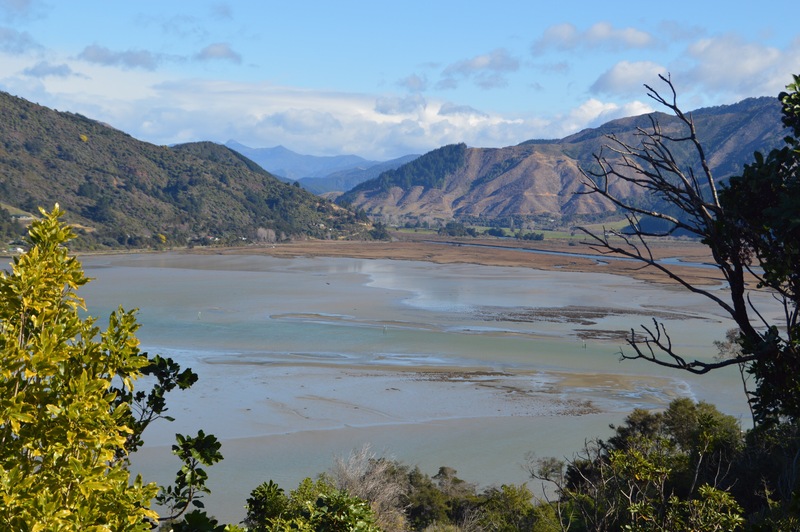 As you wind your way through the Drive to Picton, the passing scenery constantly changes from bays to hilltop views, even a sprinkling of paddocks. To miss this drive would be a shame, it does give you an idea of how the Sounds are formed. Crystal blue waters host the yachts and boats moored near the cosy, nestled houses. Even in the winter the chill, the Sounds look amazing. Every twist or corner, each bay fills your eyes with new vistas. And so it continues through to the outlook overlooking Picton. Time this right and you will have photo opportunities with either one or both ferries docked in the Port. 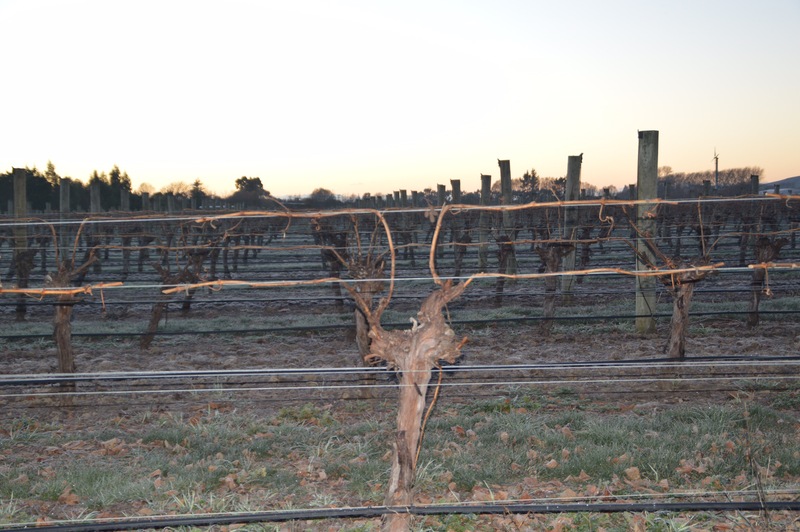 Acres upon acres of vineyards occupy Marlborough. As far as the eye can see, rows of vines stand proud against their wires. And yest, the backdrop behind some of these rows, or their neighbouring paddocks, can be breathtaking, to say the least. The pure diversity of this region is not only in the surrounding areas, but in the produce arising from this area. If you’re a wine buff, time your visit with the annual Wine & Food Festival in February. Popular with locals and visitors alike, the festival showcases Matlborough and its produce.